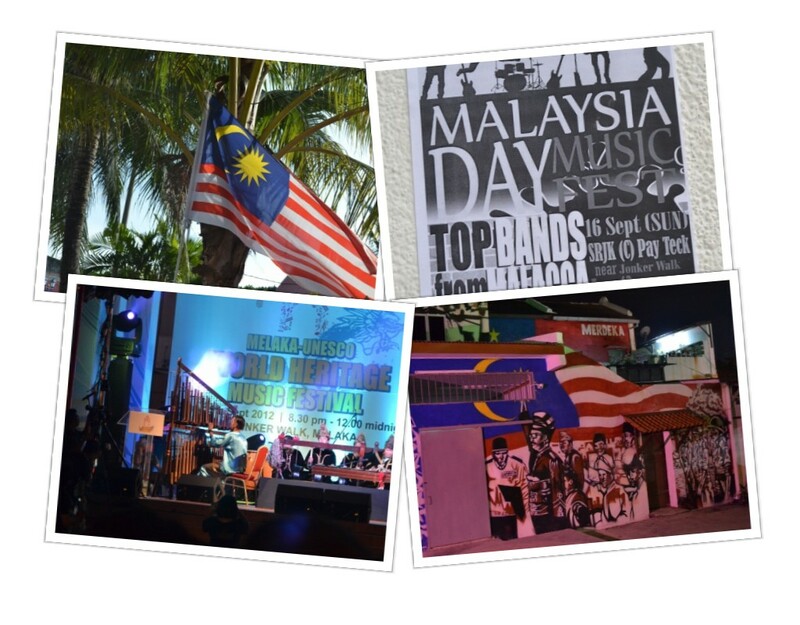 As a nation, Malaysia boasts one of the highest numbers of public holidays in the world, so it is no big surprise that our trip to the city of Melaka overlapped with Malaysia Day, a national holiday to commemorate the country’s formation. As usual, we had no idea of this before we arrived. 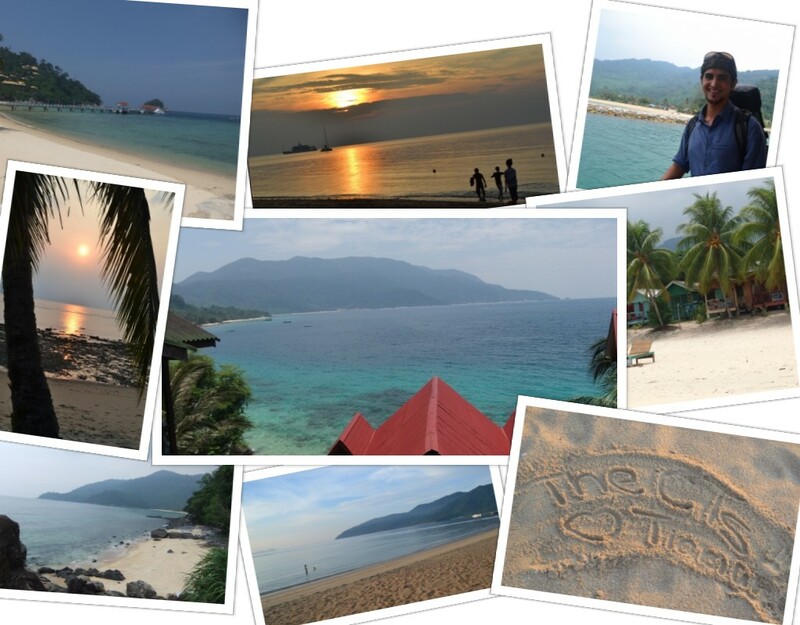 Luckily we had booked a hostel in advance based on the recommendation of a bartender on Tioman Island, so we were all set to battle the crowds when we arrived. And were there ever crowds! Since Melaka is less than a two hour drive south of Kuala Lumpur, many people from KL made the short journey for the holiday weekend. The celebration was in full swing, with live music, fireworks and food filled streets. Malaysia is a very young country, only celebrating their 55th birthday on this past Malaysia Day. As a port city, Melaka is a good representation of Malaysia’s long history of foreign control and struggle for independence. The city was captured by the Portuguese in the early 1500s, taken by the Dutch in the 1600s, then fell to the British in 1824. All of these nations exploited their military power to seize and utilize the port of Melaka as a major trading station. During WWII, Melaka was even occupied by Japanese before finally be liberated in 1948 to rejoin the current day nation of Malaysia. 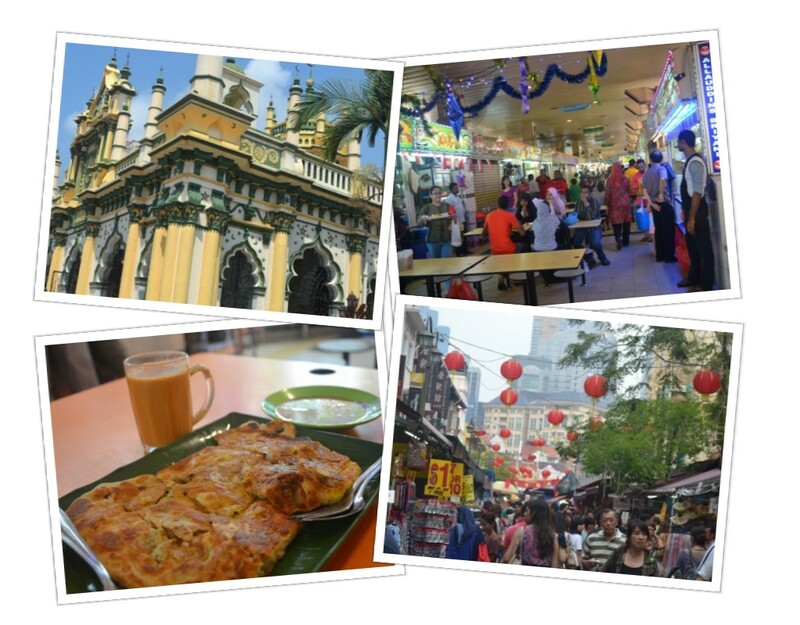 These historic factors, including the heavy immigration of Indian and Chinese populations, make the food scene in Melaka a diverse and delicious endeavor. Its been awhile since we made food the main focus of one of our posts, but our passion for it hasn’t gone anywhere. 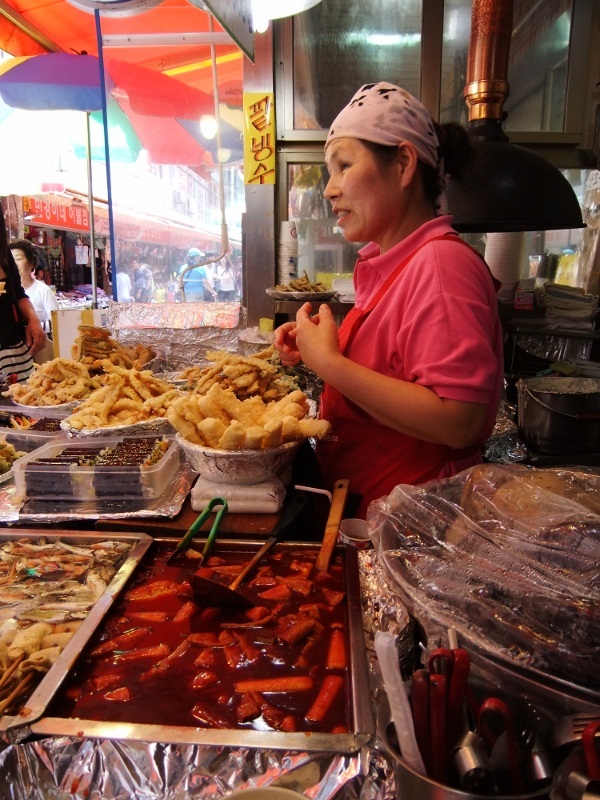 We spent a good amount of time exploring the street food scene and local restaurants. 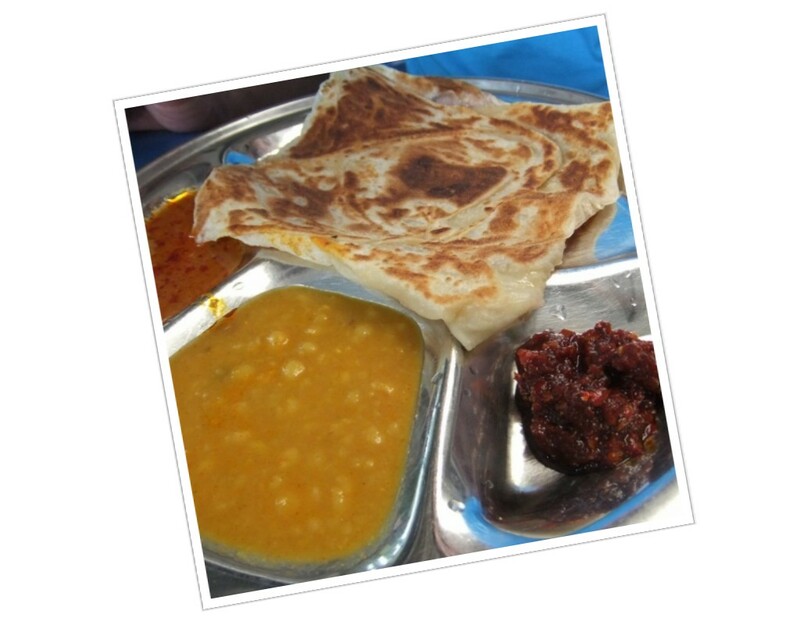 One of our favorite dishes, roti canai, is an Indian style flat bread that is served with curry and/or chickpea dipping sauce. At only 1.60RM (or about 50 cents USD) it cannot be beat. 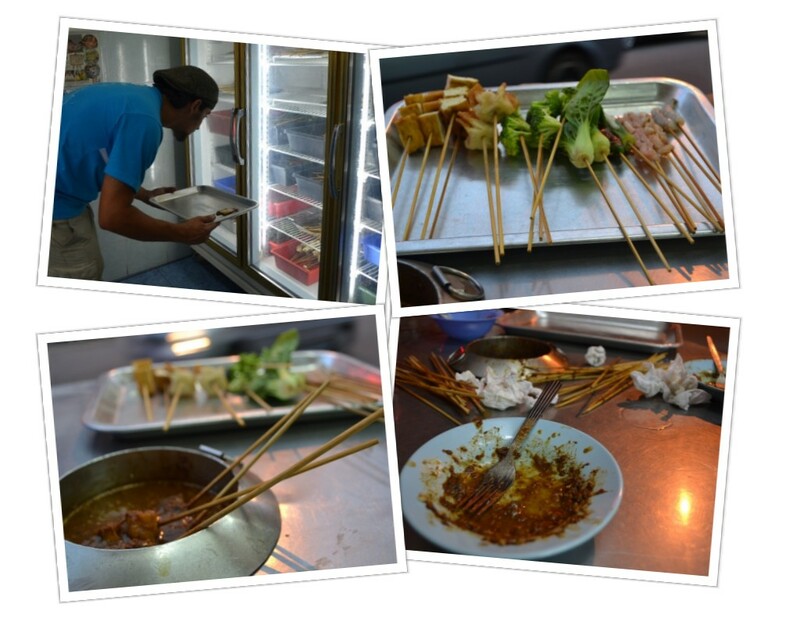 Based on a recommendation from the owner of our hostel, we headed out one night to try Capitol Satay, a famous restaurant in Melaka where you cook skewers of veggies and meat in a bubbling vat of peanut sauce at your table. We arrived to a “closed” sign, perhaps because of the holiday, and were quite disappointed; luckily, we noticed that the entire street is full of knock-off skewer restaurants imitating their renowned neighbor. We found a suitable alternative and decided to give it a shot. To put it plainly, the meal was cheap, fun and delicious. The food stalls at the weekend night market on the popular Jonker Street are a good representation of Melaka’s melting pot. Everything from chicken rice, poh piah, potatoes on a stick, grilled seafood, stir-fried radish cakes, sushi, noodle bowls, sweet iced drinks like soya milk and hibiscus tea, dumplings, sago gula Melaka, shaved ice, and so much more are available. Aside from chowing on food all day long, we managed to get ourselves out for a bit of sightseeing as well. As is evidenced by the multi-cultural food scene, the presence of diverse religions is also clear. 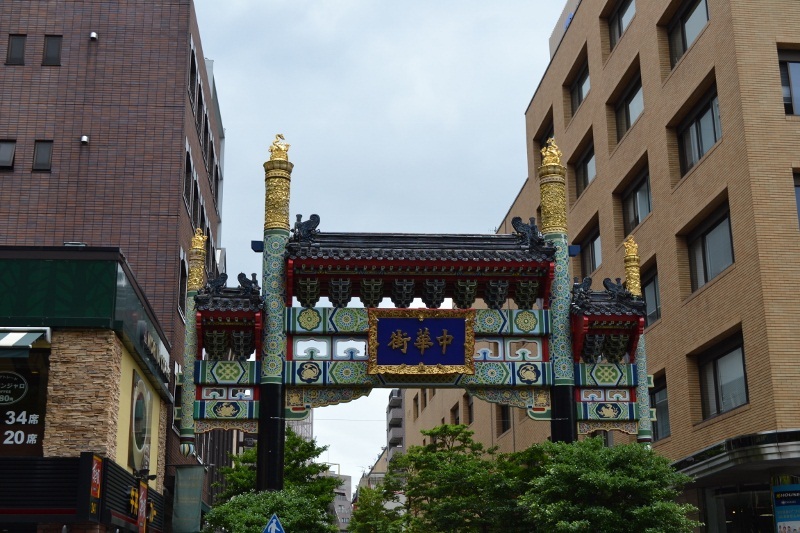 In one block you can walk by an ancient Buddhist temple, a mosque, and a Christian church. 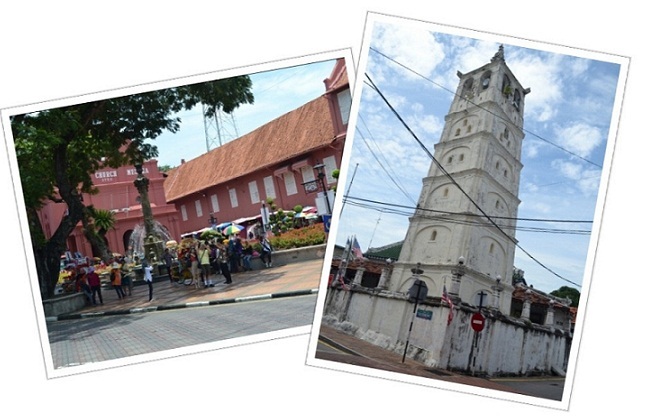 One day when we were walking through the Dutch Square, we decided why not go inside the Church of Melaka? While the architecture wasn’t particularly impressive, there seemed to be a service about to begin so we grabbed a couple hymn books and sat down to join. After reading through a few pages, Mike looks up and says “Is this a memorial service?” It sure was, and next thing we know a casket is being wheeled in through the front door. It was an awkward moment to say the least, but we managed to squeeze out the side door before anyone could ask us to share a memory about the deceased. Phew, that was a close one. 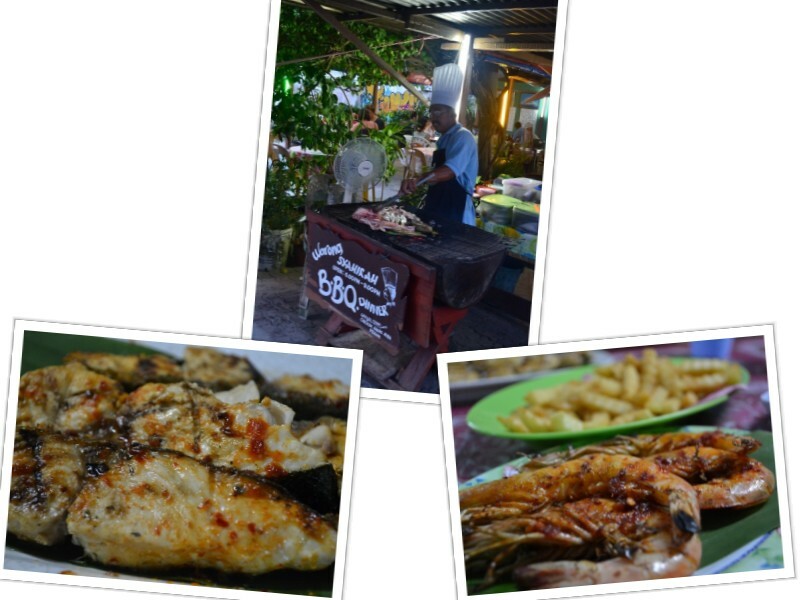 After celebrating Malaysia Day and grubbing our way through Melaka, we were faced with the choice of how to best fill our two weeks of time before catching our October 2nd flight to Perth. 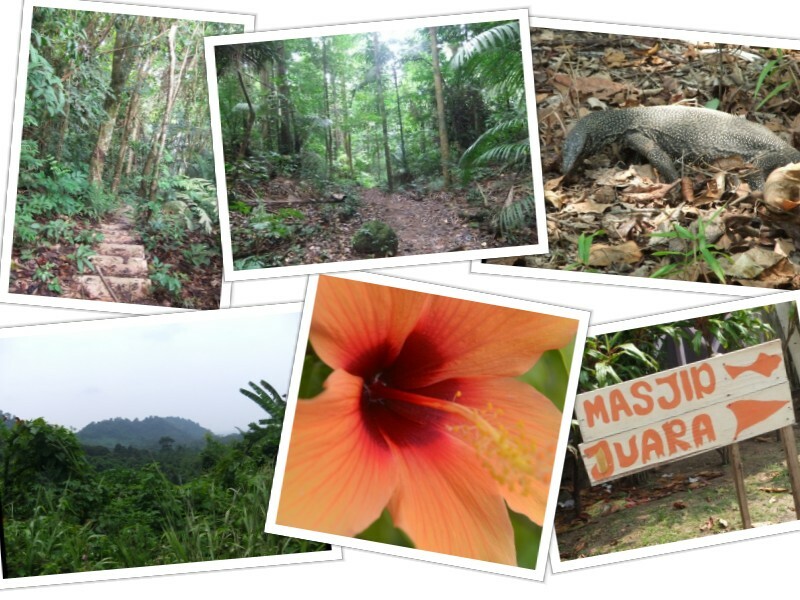 Two weeks is certainly enough time to explore some of Malaysia’s great national parks and the well-known Cameron Highlands, but we realized that after 8 months on the road, we had hit a bit of a wall; we were not tired of traveling, we were tired from traveling. 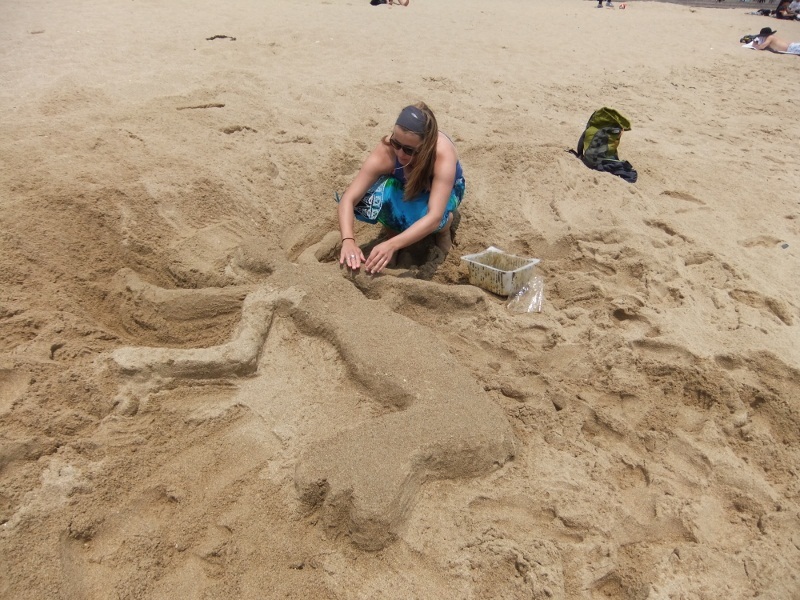 There was only one solution that we could see, so we did what any reasonable person would have done…We found another great island and decided to spend the remainder of our days here basking in the sun. A lot can happen in a week. 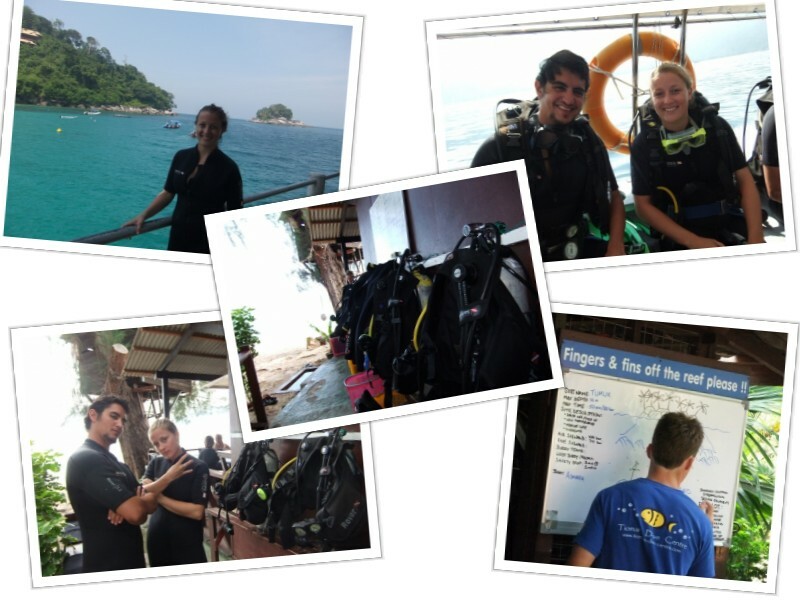 Since we last wrote, we’ve played with tigers, ridden on elephants, watched knockout Muay Thai, honed our motorbike skills, climbed Thailand’s highest peak, and so much more. Where did we do all of these spectacular things? A little place called Chiang Mai. Not so little actually, Chiang Mai is the second largest city in Thailand making it somewhat of a “capital” for the northern region of the country. While it doesn’t have the skyscrapers, mega-malls, and constant adrenaline of Bangkok, Chiang Mai still seems to have something for everyone. We easily could have spent a month there, but the tourists visas we acquired at the border with Cambodia were only valid 15 days, so we had to leave before we were ready to say goodbye. Thanks to our friends Daniel and Libby, we got a taste of home and some great suggestions of what to do and see in the city. 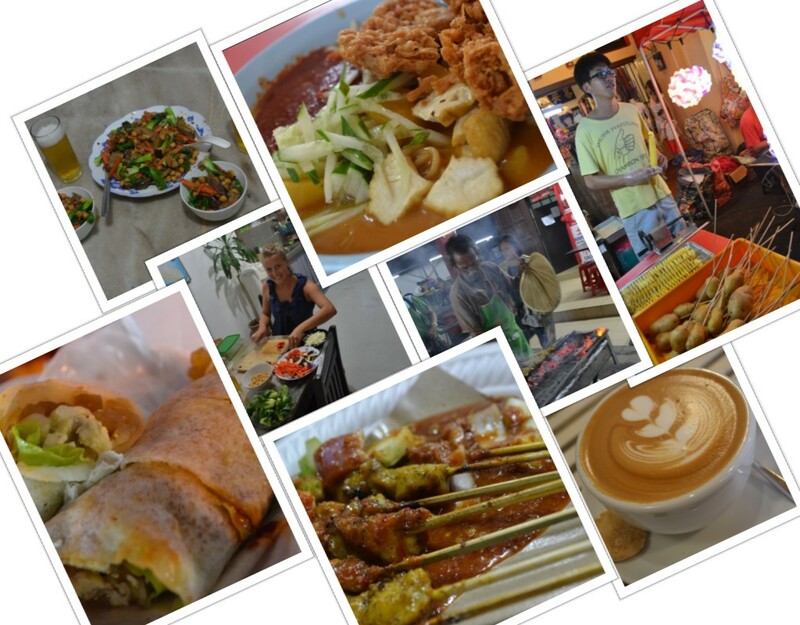 Here is a glimpse at the different faces of Chiang Mai. Amy is a cat lover through and through, and since childhood Mike has been watching Jake Jabs play with baby tigers on those annoying American Furniture Warehouse commercials; so when we learned about Tiger Kingdom just outside of Chiang Mai, we jumped all over it. As the name would suggest, this place is crawling with tigers! Tiger Kingdom does not drug their animals prior to allowing visitors into the animal enclosures. This is evident from their playfulness and alert demeanor. For our visit, we chose to get in the cage with the little guys. 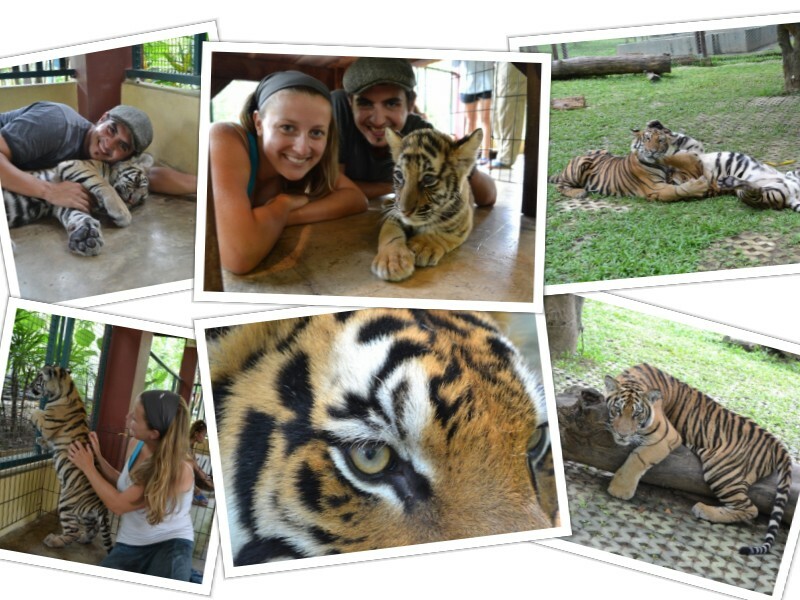 The tiger cubs we played with were 2-4 months old and beyond adorable. Unfortunately, we couldn’t come up with a plan for lifting one in the fifteen minutes we were allotted, but we did get plenty of pictures. As Thailand’s national animal, elephants are an important symbol of the country’s culture and history. 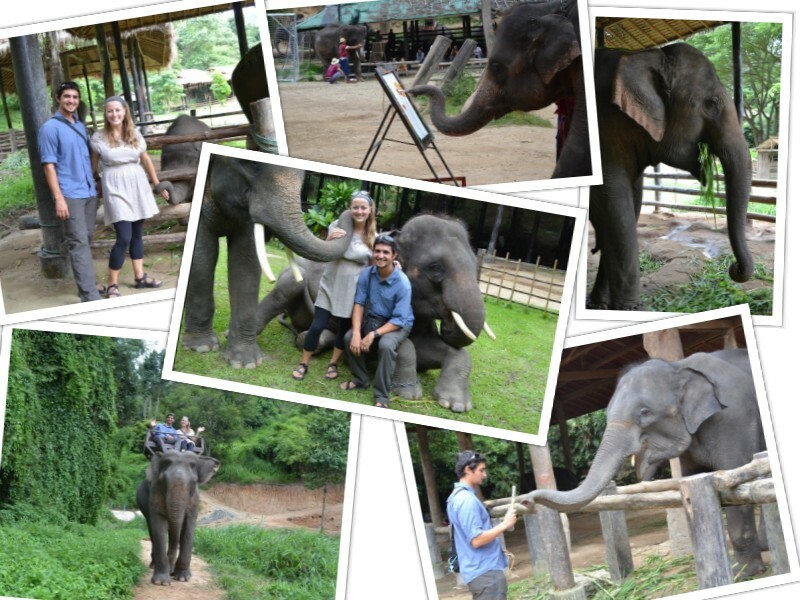 Chiang Mai is home to numerous elephant sanctuaries, some more concerned with the elephants’ well-being than others. We took the advice of our friends and visited a place called Maesa Elephant Camp, a place that rescues elephants from bad situations and breeds baby elephants to increase the dwindling population in Thailand. During our visit, we saw a 4 month old calf with his mother, fed bunches of bananas and sugarcane to a herd of hungry elephants, and even rode on the back of an old-guy by the name of Poo Somboon. He was 41 years old and carried three of us on his back like it was nothing. The camp even has a daily show where the elephants play harmonicas, paint incredible pictures, and shoot soccer goals. There is no doubt that the elephant trainers love and care for these animals, and we can only hope that the elephants themselves also have fun preforming. We also got a close look at one of the most dangerous animals around, the Muay Thai kickboxer. You don’t want to mess with these guys or gals. Muay Thai is the nation’s favorite sport and for good reason. 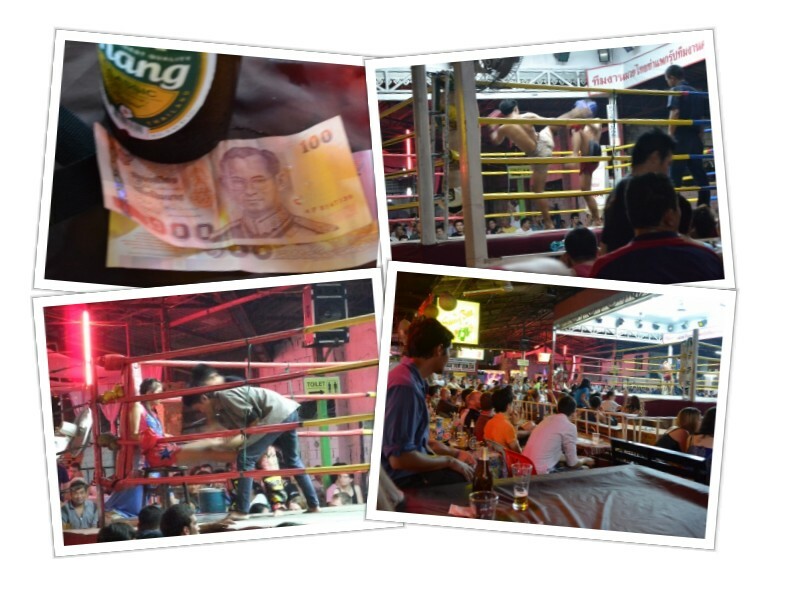 We spent an evening watching several fights at a local arena in Chiang Mai. The night began with two female fights then moved on through increasing weight classes of men. Although gambling is technically illegal in Thailand, throwing down a few Baht between friends is common and makes things a bit more interesting. While small, the female kickboxers who started things off fought with great ferocity. The male fighters, on the other hand, were more methodical in their attacks. Unfortunately, the “main event” didn’t even last one round; a knee to the kidney and kick to the temple ended things quite quickly in a knockout. 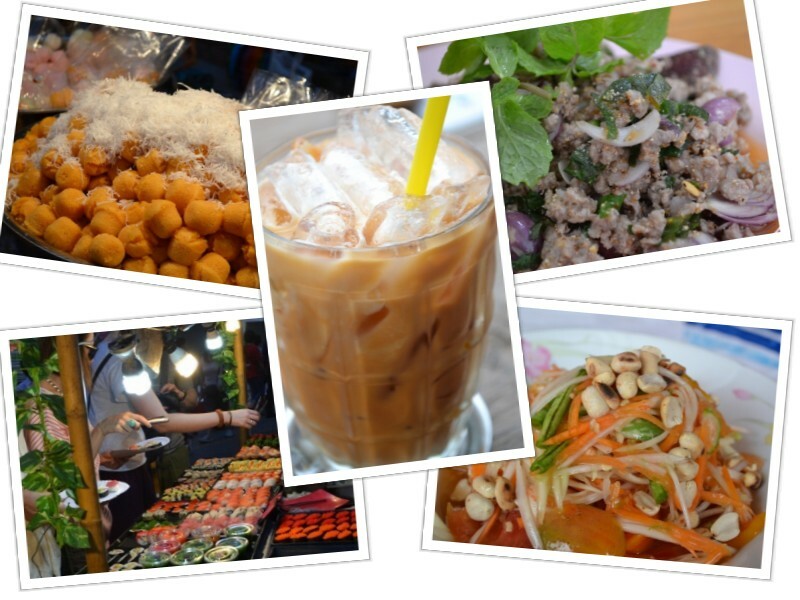 We can say with confidence that Chiang Mai has the best street food scene that we have experienced thus far in SE Asia. The weekly Saturday and Sunday markets boast endless options of Thai food and other interesting specialties like sushi, Indian and Burmese food. 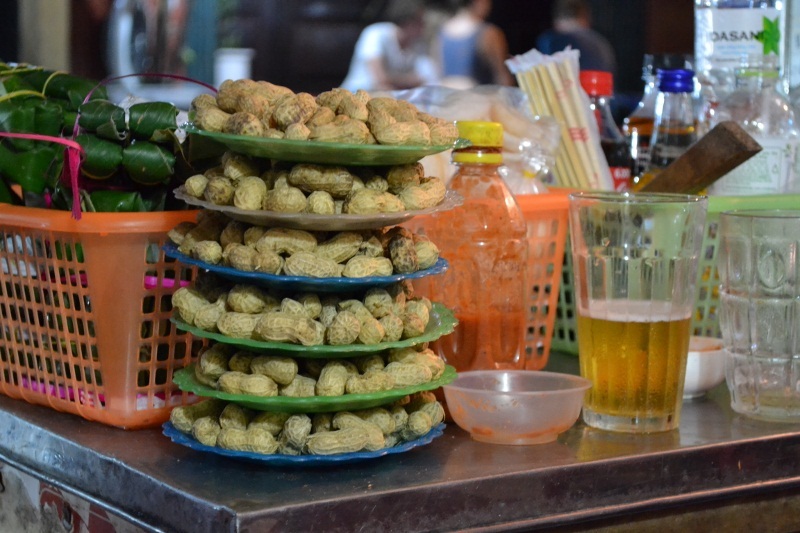 We spent our weekend evenings in Chiang Mai grazing through the stands and ended up absolutely stuffed each time. For those with more than a few days to spend in Chiang Mai, we recommend getting out of the city center to visit a doi (meaning mountain in Thai). We spent one day with our friends driving up Doi Inthanon, the tallest mountain in Thailand. The air became cooler and less tainted with pollution as we scaled the mountainside. 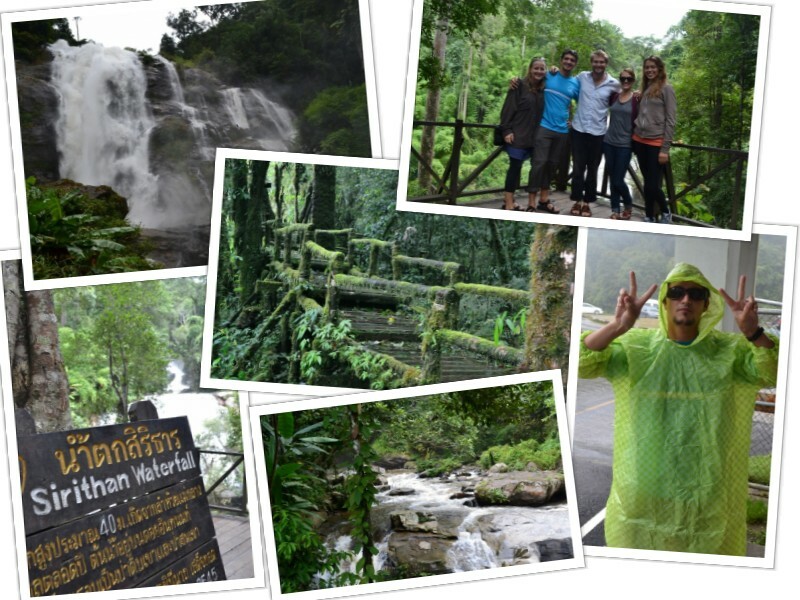 Thick fog had engulfed Doi Inthanon that day, and the rain was relentless, but we still had fun walking through some trails and visiting a few waterfalls. 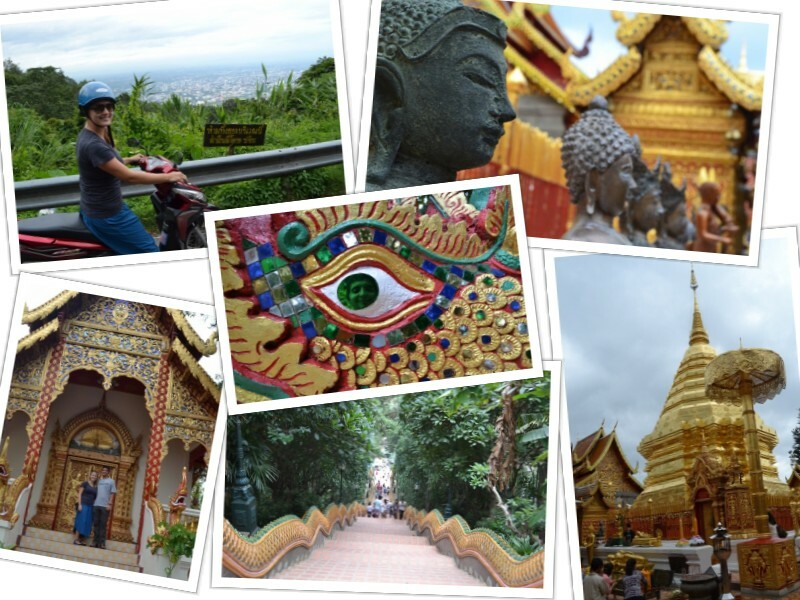 Another more easily accessible mountain is Doi Suthep, which is a short 25 minute drive from the center of Chiang Mai. We rented a motorbike one day to visit the temple that is perched on the top of this mountain, Wat Phrathat. 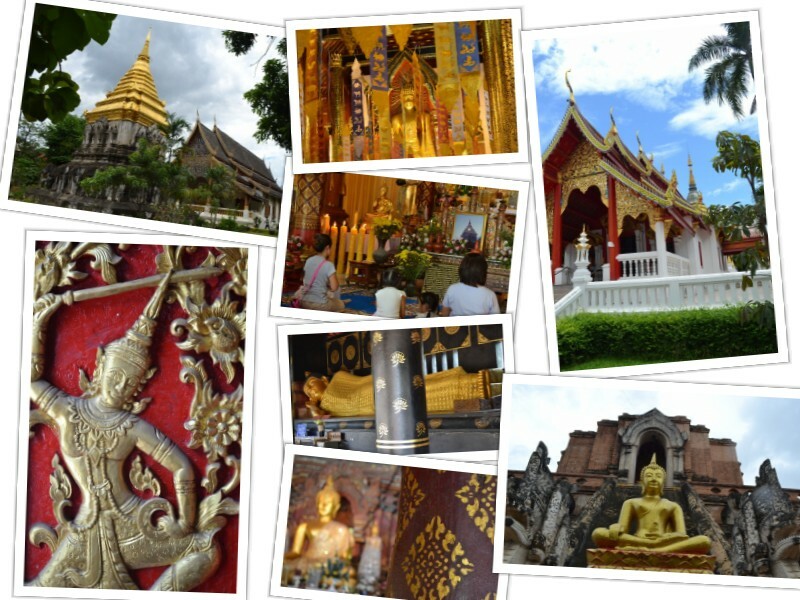 The temple itself is stunning, and the panoramic views of Chiang Mai cannot be beat. After several action-filled days, we were ready for some relaxation. Having heard of the infamous Thai massage, we wanted to give it a try. You can’t walk down a street in Chiang Mai without seeing two or three spas, so it was easy enough to find a spot. We can’t say that getting a Thai massage is the most relaxing experience, but it definitely awakens your muscles and works out the kinks. It’s kind of like visiting a masseuse and chiropractor at the same time. An afternoon stroll through the streets of Chiang Mai will lead you by countless ornately decorated temples. We spent an entire day just marveling at these wats and stopping for Thai Tea along the way. Turns out that it was Buddhist Lent during our visit to Chiang Mai, so we saw lots of activity at the temples. There is nothing like a familiar face, especially when you haven’t been home in seven months. This blog is dedicated to our friends Daniel and Libby – thank you for sharing your home with us for the past week and showing us a great time in Chiang Mai! The hours spent playing cards, telling jokes, and sipping coco locos made us feel so at home. 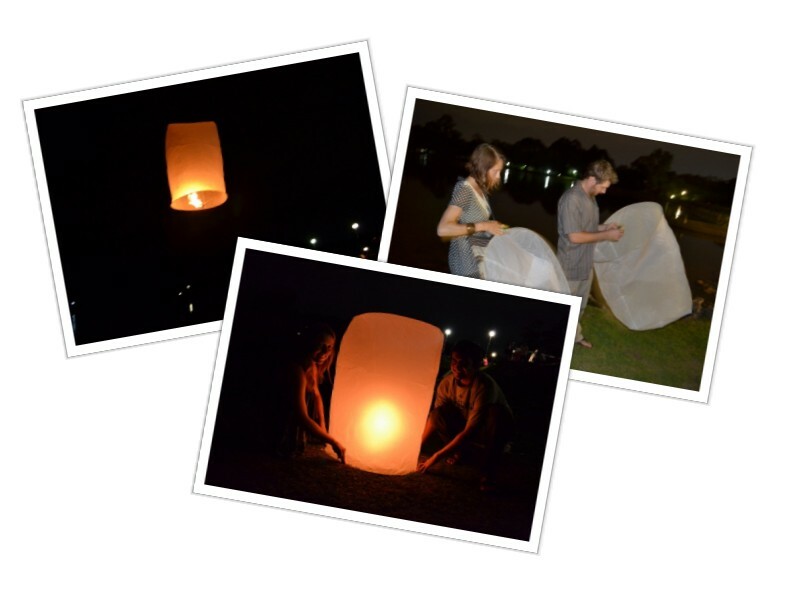 The farewell lanterns were the perfect end to a great week. We have finally arrived in SE Asia! While we always strive to live in the moment, we have secretly been longing to get to this part of the world since we left home. Stories of the region’s hectic streets, friendly people and incredible street food make it a legend in hostels around the world. These tales of a backpacker’s paradise sparked our interest long ago. After a few days, we became accustomed to walking in the street (the sidewalks are too cluttered to actually walk on) and weaving our way between bikes and cars. Our heart rates gradually lowered, and we started soaking up the good vibes that flow through this city. 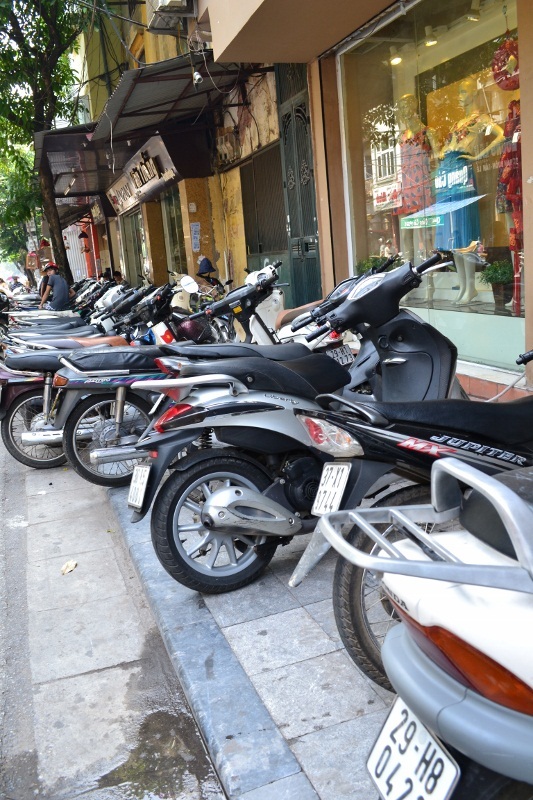 The word sidewalk shouldn’t be used in Hanoi. 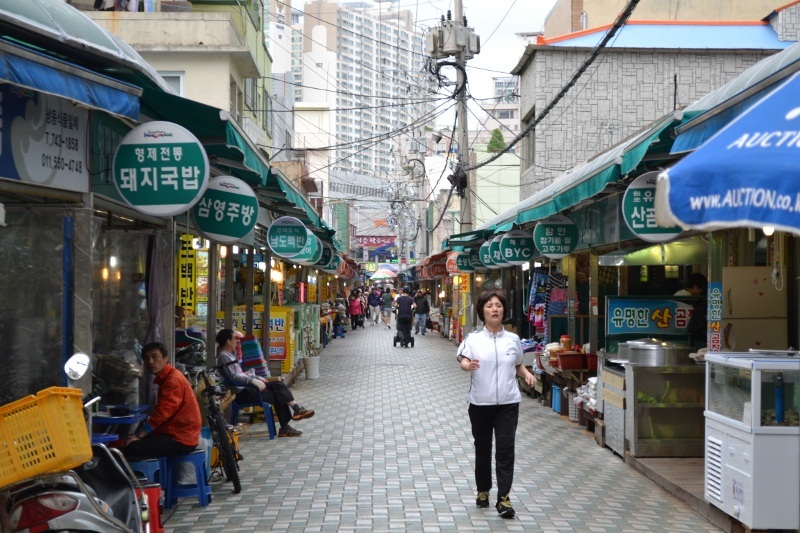 They are all unofficial parking lots, shops, or restaurants. Before arriving in Vietnam, we had heard stories from other travelers about tourists getting fleeced right and left. More than one person told us that they will never return to Vietnam; it made the Vietnamese sound very unwelcoming and unfriendly. We found it to be the exact opposite. 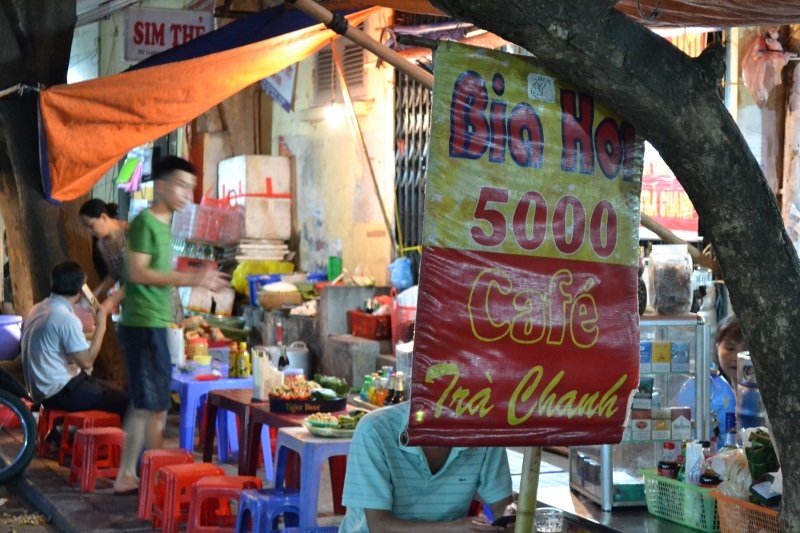 Every local we met in Hanoi said hello with a smile, and not one person tried to overcharge us, much less steal from us. 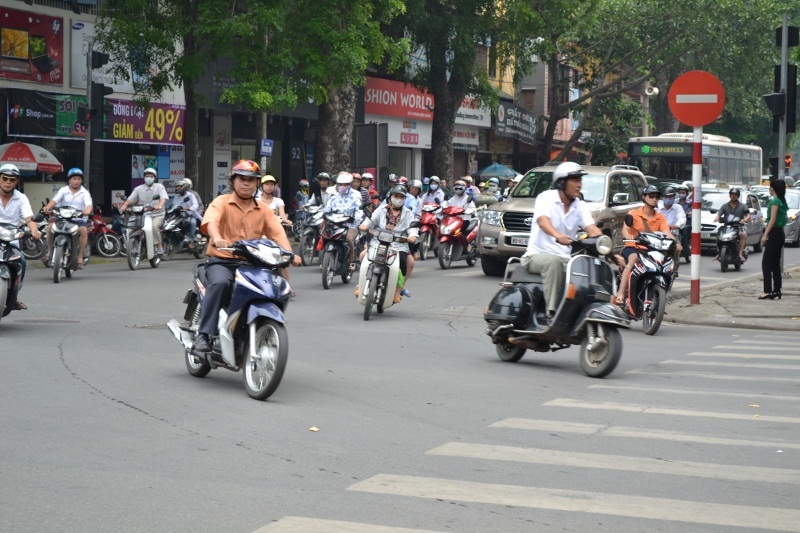 It is the people of Hanoi that create the positive and upbeat vibe that we mentioned above. There is no doubt that Hanoi is an epicenter of history, and although the city has a handful of tourist sights, we most enjoyed simply walking around the old town and seeing how the city works. It is really quite fascinating to see the systems that exist below the layers or chaos. 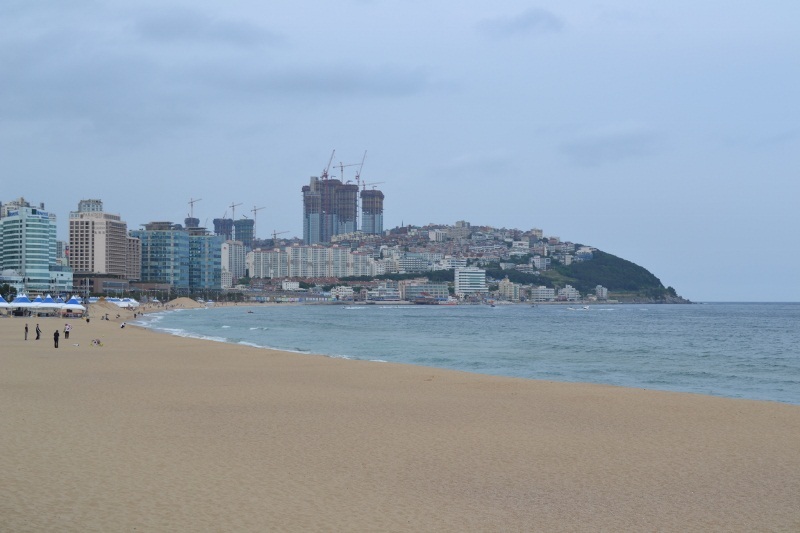 We didn’t want to spend our whole time there just lounging around, so we dedicated about two half days to sightseeing at the following places. Hỏa Lò Prison, called the “Hanoi Hilton” by American POWs. 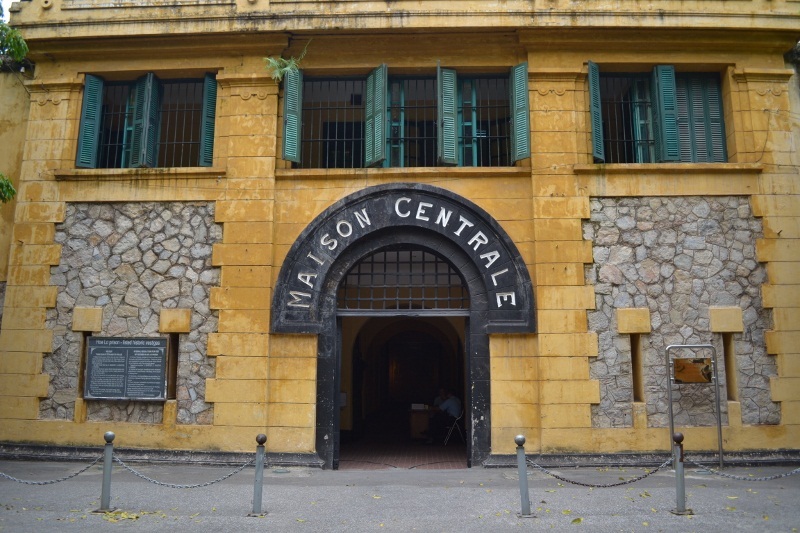 Built by the French and used to imprison Vietnamese revolutionaries. Its most famous American prisoner? John McCain. 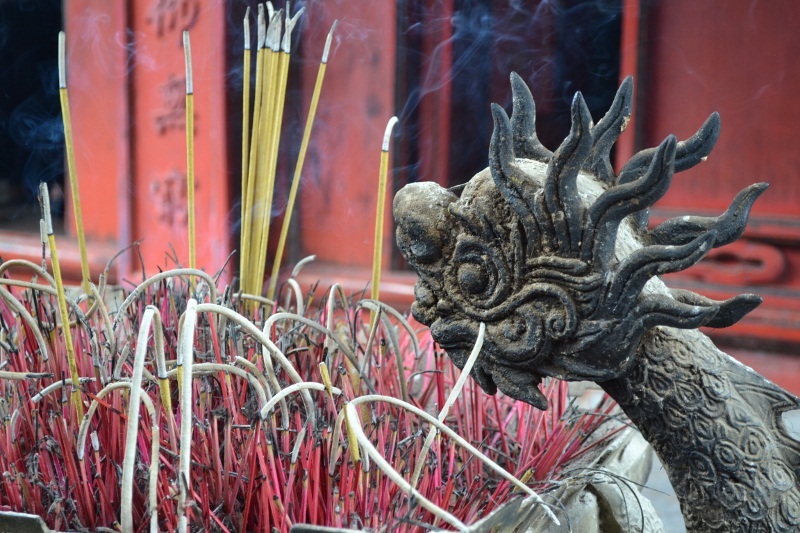 Offering of incense in front of the Temple of Literature. 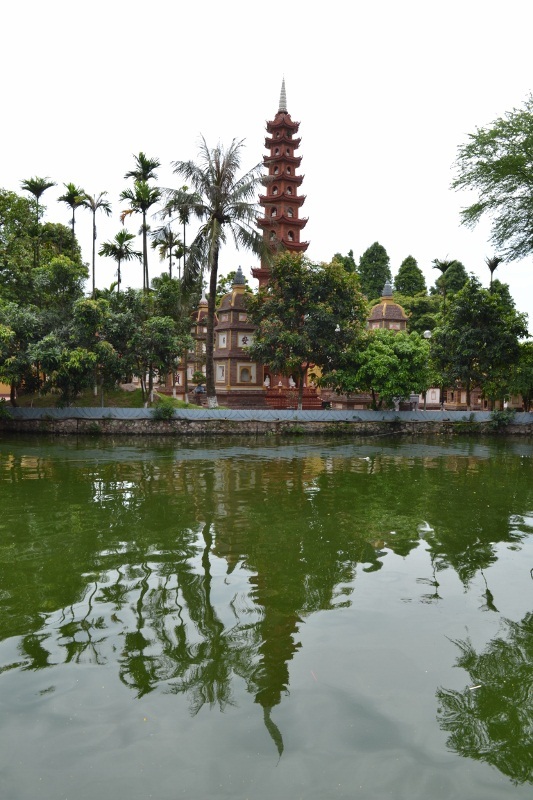 Tran Quoc Pagoda in West Lake. 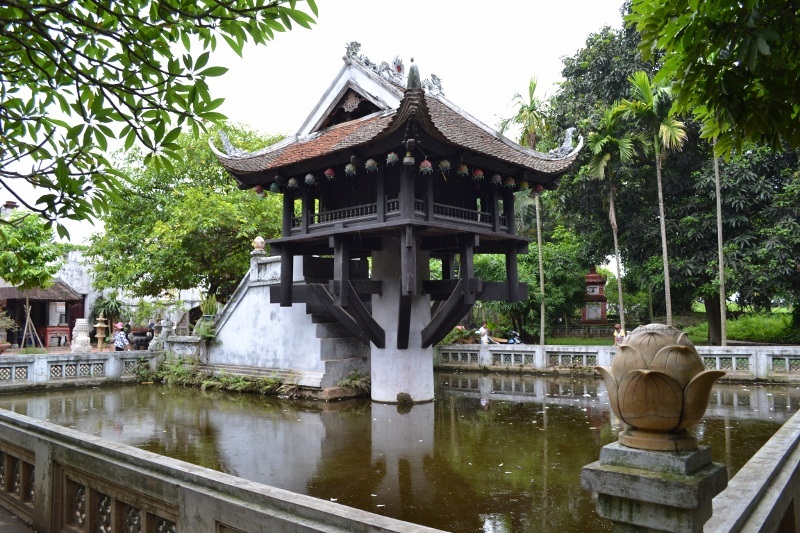 The oldest pagoda in Vietnam. 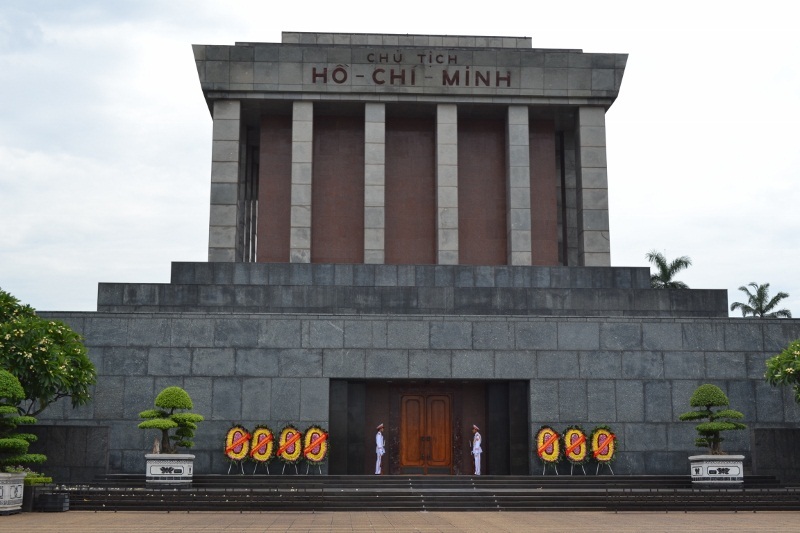 Ho Chi Minh’s Mausoleum has strict visitor policies, similar to that of Chairman Mao. 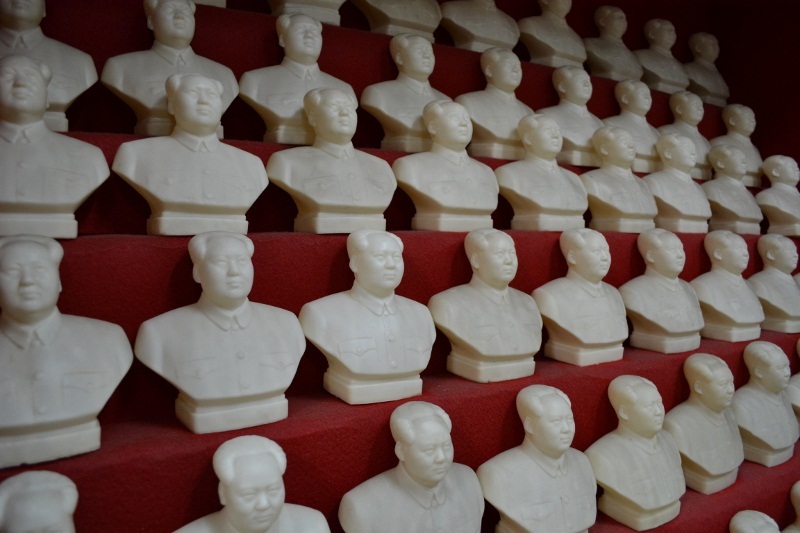 After having visited Mao’s Mausoleum in Beijing we chose to forgo looking at another wax-covered corpse. The One Pillar Pagoda, a Buddhist temple. Sightseeing in Hanoi will really take it out of you. With the temperature over 30˚C and humidity close to 100%, we could only handle walking around town for a few hours at a time. Multiple showers per day, constant hydration and brief visits to buildings with air con helped us beat the heat. Many people cautioned us to not visit SE Asia in the summer because it is the hottest time of year and the rainy season, but to us, the frequent afternoon downpours are always a welcomed occurrence. One of our favorite mid-day activities in Hanoi was stopping for some “bia hoi.” Bia hoi is Vietnamese for “fresh beer” and is quite possibly the cheapest draft beer in the world at 5,000 Dong (25 cents) per glass. It is not the most flavorful drink around, but in the sweltering heat it really makes you smack your lips and say “ahhhhhh” as your body temperature drops a couple degrees. There are many places around the city to quench your thirst, but on our first day in Hanoi we found a spot that we liked and kept coming back. We spent many hours there chatting with the owner, playing with her son and drinking with the locals. After a few days, we felt like part of a small community there and were sad to say goodbye. Never drink a bia hoi without a snack. Shrimp chips, peanuts, and pork in banana leaves seem to be the munchies of choice. One of the things that we liked most about Hanoi is that it is easy to distinguish the tourist traps from the genuinely local places. We have learned that the backpacker trail through Vietnam is well defined, with Hanoi being a hub for nearly all tourists that visit the country; therefore, Western-oriented establishments are ubiquitous. Ones that consist of very small plastic stools and tables on the sidewalk are a good indication that you are in for the real deal. These types of restaurants are the definition of hole in the wall. Sometimes they have a small portable cooking station on site, other times your order is relayed via cell phone to a kitchen down the street, and 10 minutes later someone comes walking down the block with your meal in hand. Check out this kitchen. 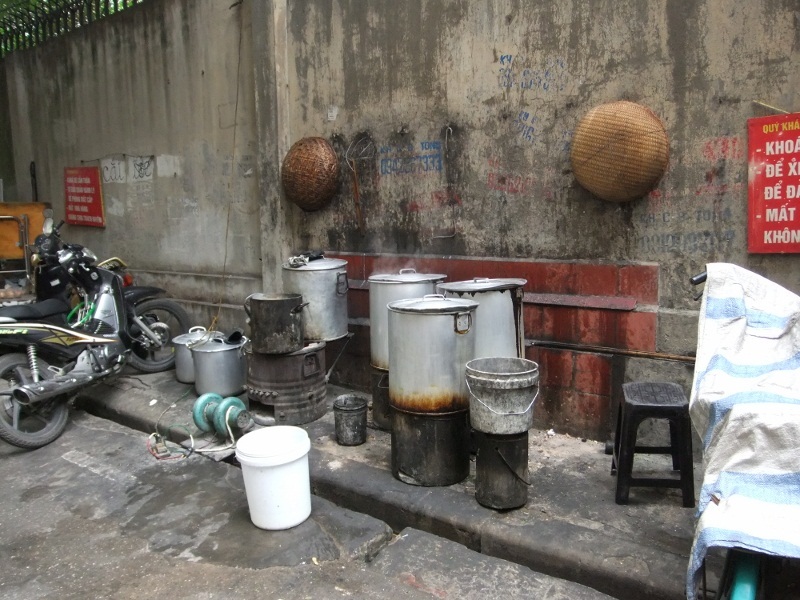 The health department in Hanoi must have very strict standards. 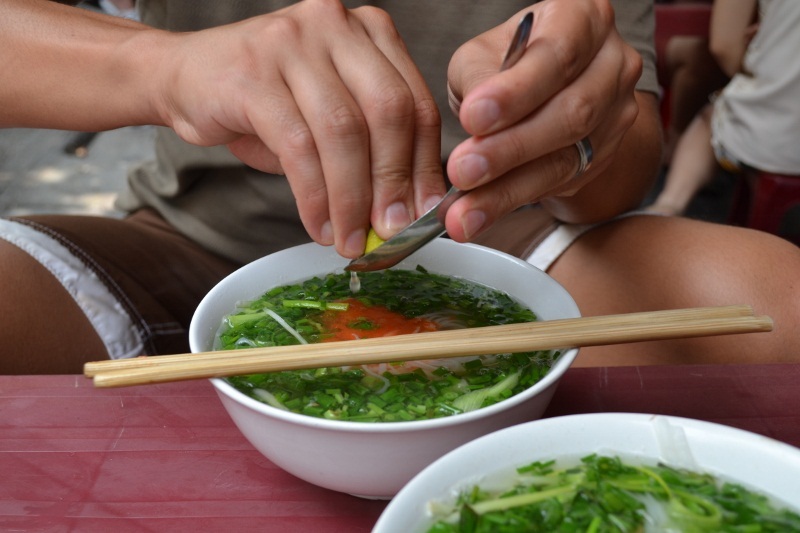 We didn’t know a whole lot about Vietnamese cuisine before arriving, and while we don’t have a firm grasp on the regional specialties just yet, we certainly got our fill of phở while in Hanoi. We were on a mission, just like Anthony Bourdain, to find the best bowl of phở around. 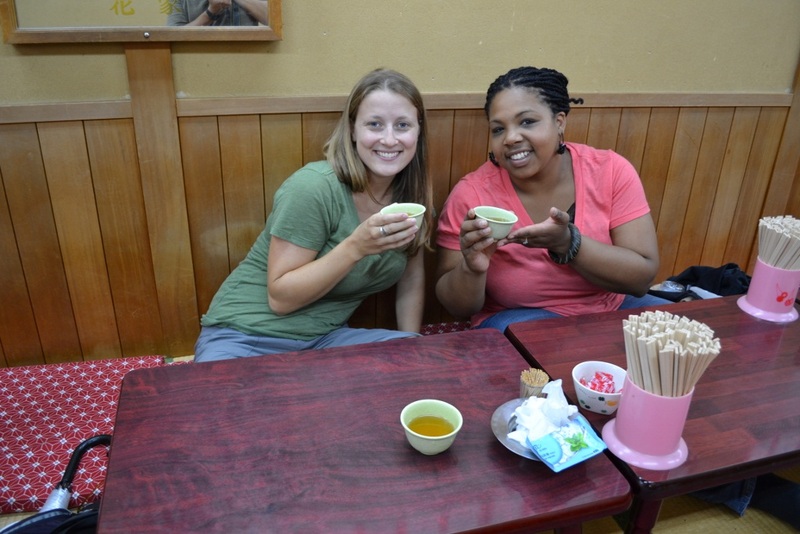 We ate it every day for at least one meal, and came across a wide variety of styles. There is no way to decide on the best bowl of phở in Hanoi, but there are a few indicators that will let you know you’ve found a great phở spot, which Bourdain’s video explains in hilarious detail (watch it here). We couldn’t have said it better ourselves! 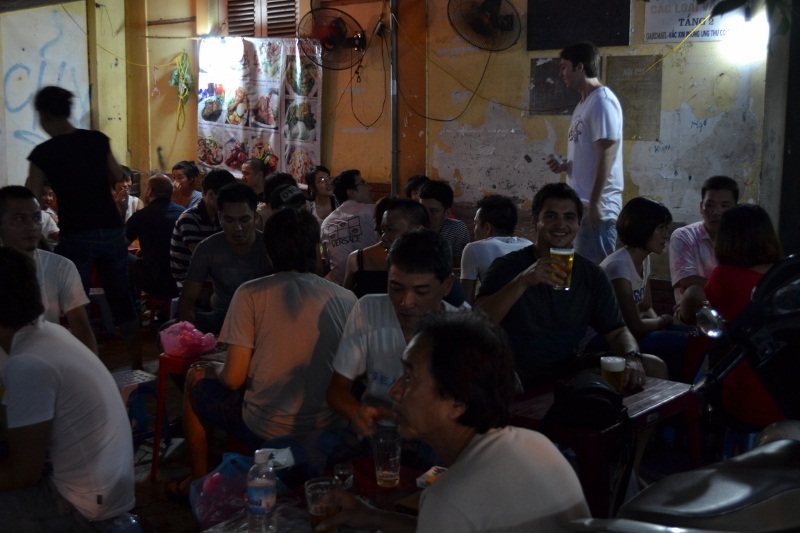 Hanoi electrified us, kept us on our toes and eventually made us feel at home. While getting advice from fellow travelers can be an incredible resource, the moral of the story here is that you shouldn’t always believe what you hear. The only way to know for sure whether or not you are going to like a city is to experience it for yourself. We only had three days in Tokyo, so we had to make the most of this electrifying city. To write the end before the beginning, we can sum it up by saying we left Tokyo with a strong desire to return. 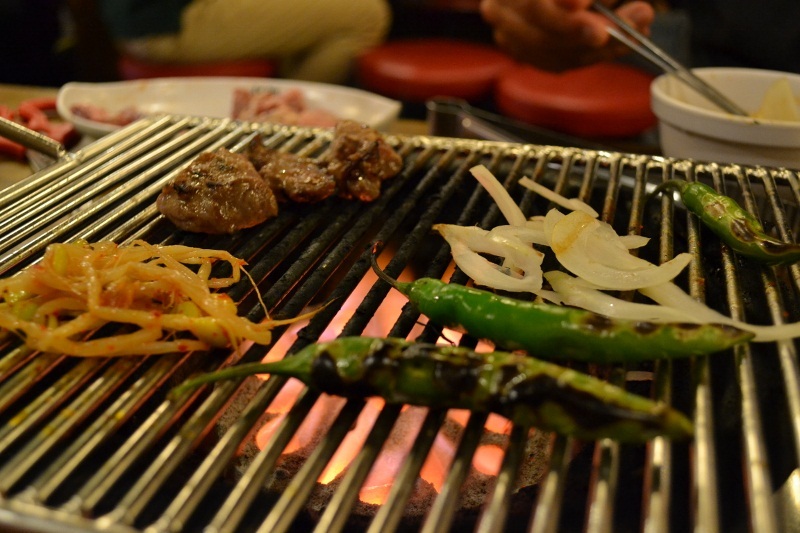 In the first part of this series, we will share with you the incredible food scene we experienced in Tokyo. 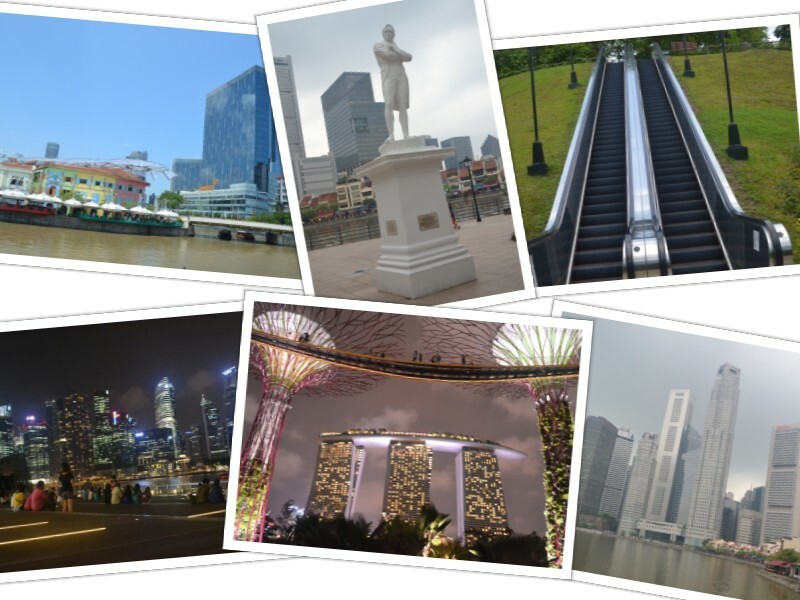 Part II will delve into our exploration of some of the city’s sights and neighborhoods. Do you ever wonder where that little piece of tuna you’re eating came from? 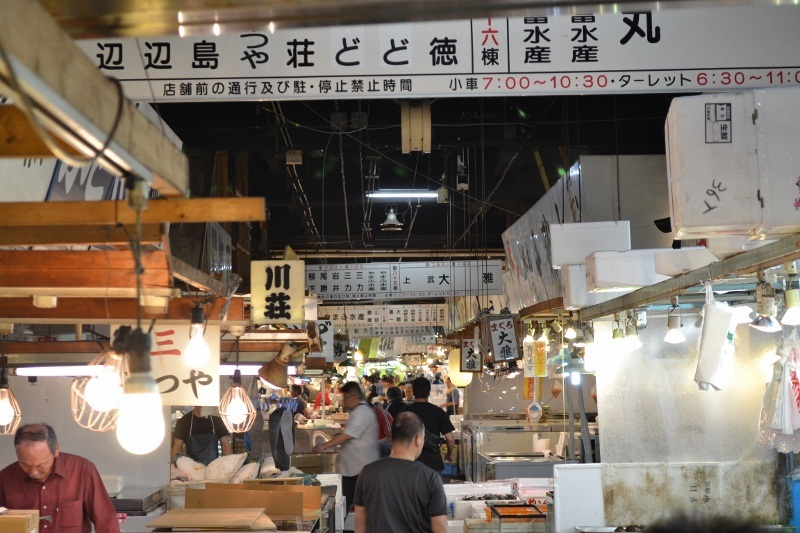 While it’s hard to know for certain, there is a pretty good chance it passed through the Tsukiji Fish Market in Tokyo, the largest fish market in the world. The action starts early here, with fish auctions for the high-end catches running from 5am to 7am. We arrived around 6:30am and dove right into the chaos that consumes the heart of the market. 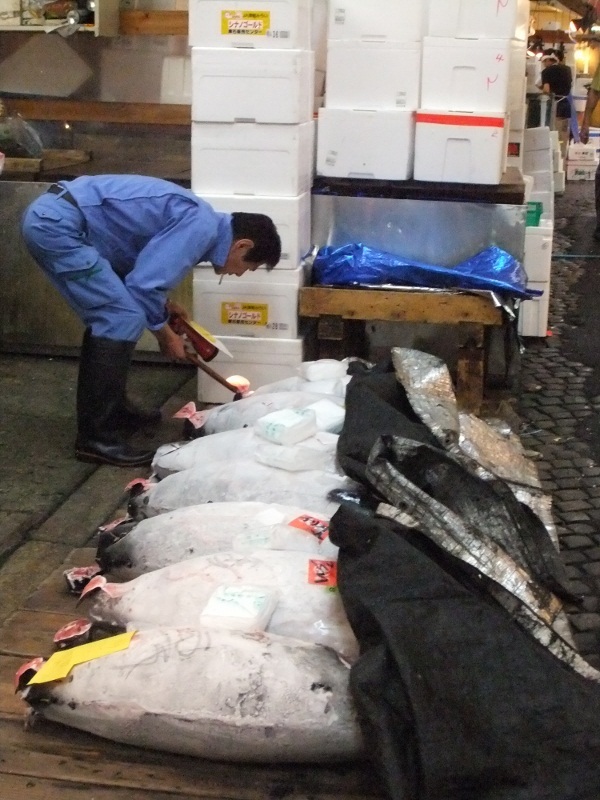 This is not your typical neighborhood fish market; Tsukiji is home to fishermen who are selling massive quantities of fish to wholesalers. 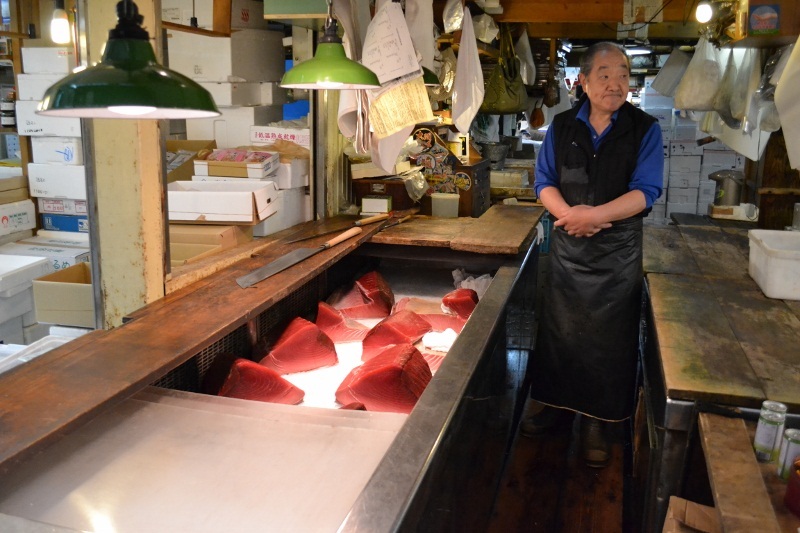 According to Wikipedia, over 400 types of seafood are sold at Tsukiji on any given day. 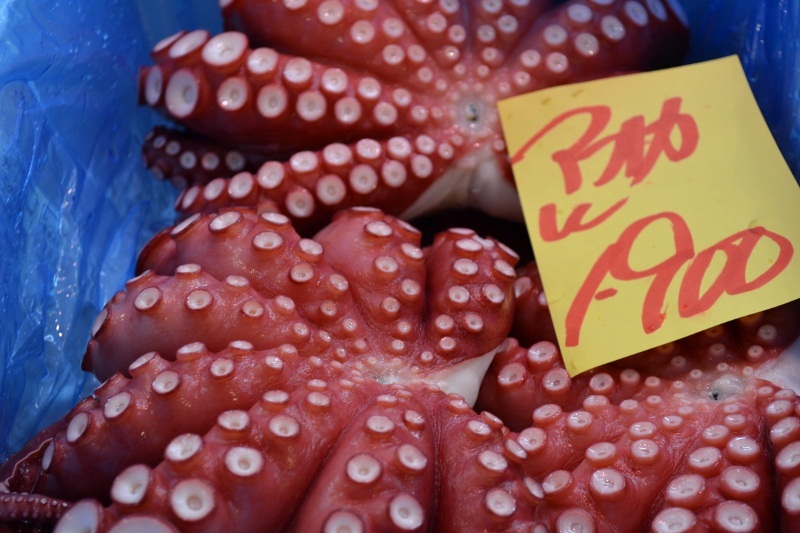 If it lives in the sea and can be eaten, it’s sold at Tsukiji Fish Market. Ominously glowing pieces of tuna. Aren’t they stunning? Aside from the extra large bivalves and colorful octopi, we were most impressed by the humongous tuna that we saw. 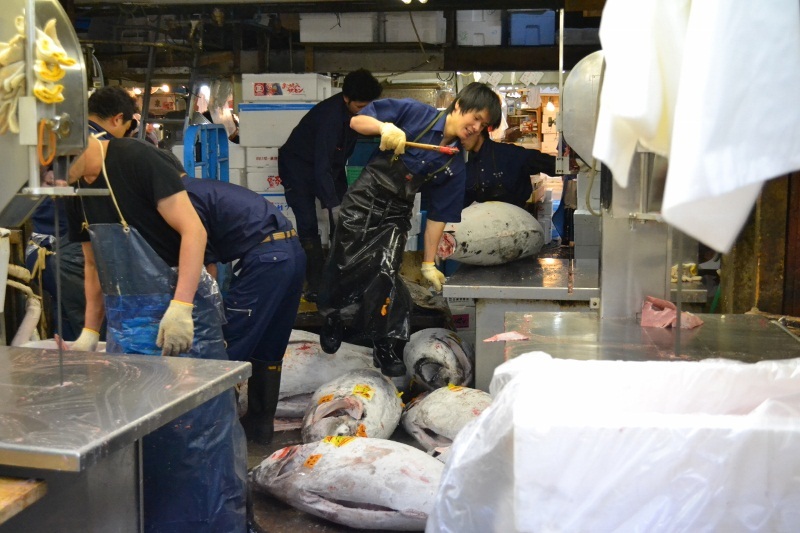 Workers handled these whole frozen tuna with hooks and gloves, maneuvering them from the ground to counter tops. 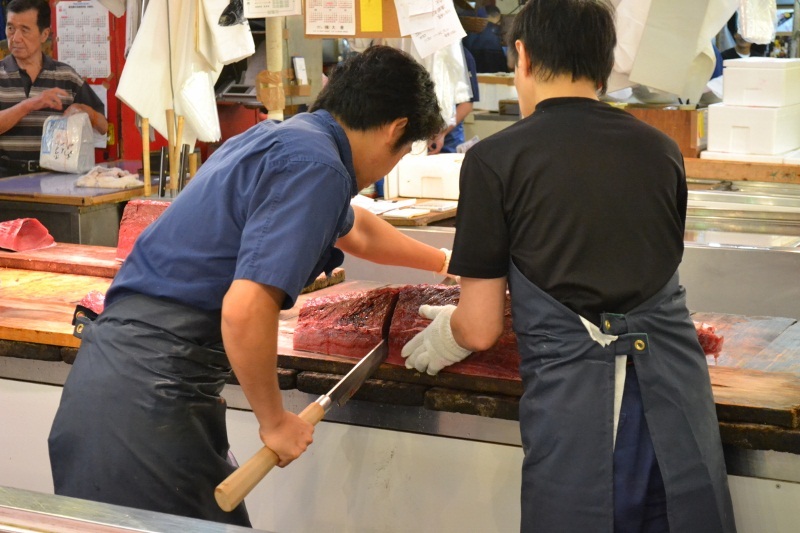 There, they are cut in half using band saws and then into smaller pieces by knives that looked more like swords. You do not want to get between this guy and his tuna. “Call that a knife?” This is a real knife, Mr. Crocodile Dundee. 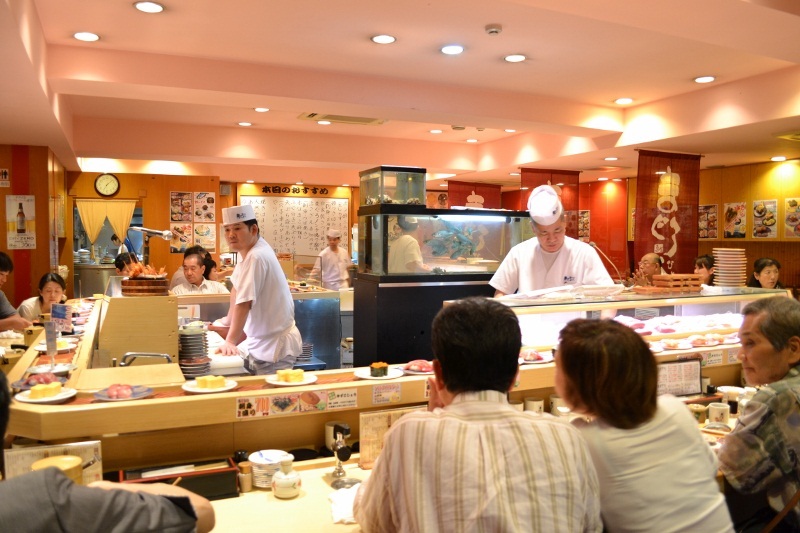 Although a novelty in the States, sushi train restaurants are not so uncommon in Japan. Excited to try some of the fish we saw at Tsukiji the day before, we headed out to dinner at a sushi go-round in the Asakusa neighborhood. We enjoyed some of our favorites, such as Hamachi (yellow tail) and Aji (mackerel) and also tried a few new things, including abalone and crab miso soup. 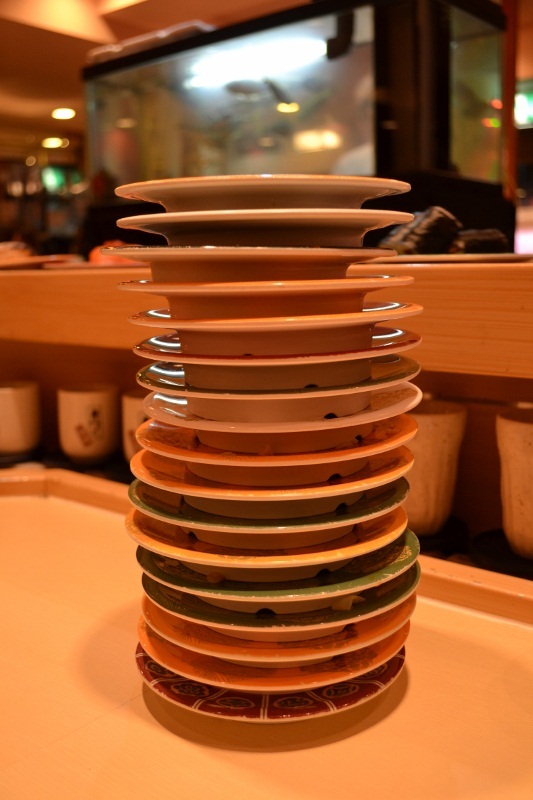 After the waiter tallied up our tower of plates, which ranged from 180-700 Yen/plate, and added in our sake, the bill came to about $50 USD. Not exactly a cheap meal, but compared to a sushi dinner for two at home, it was a steal. Well worth the dent to our backpackers’ budget! Many fantastic restaurants in Tokyo are very unassuming. There is little to no signage out front, and you often do not even realize they are there. We were intrigued by a certain restaurant near our hostel. Each day during lunch, we noticed a line of people that stretched down the block, but in the evening it was hard to tell if the place was even open. The front doors were shut, and the building had no windows. 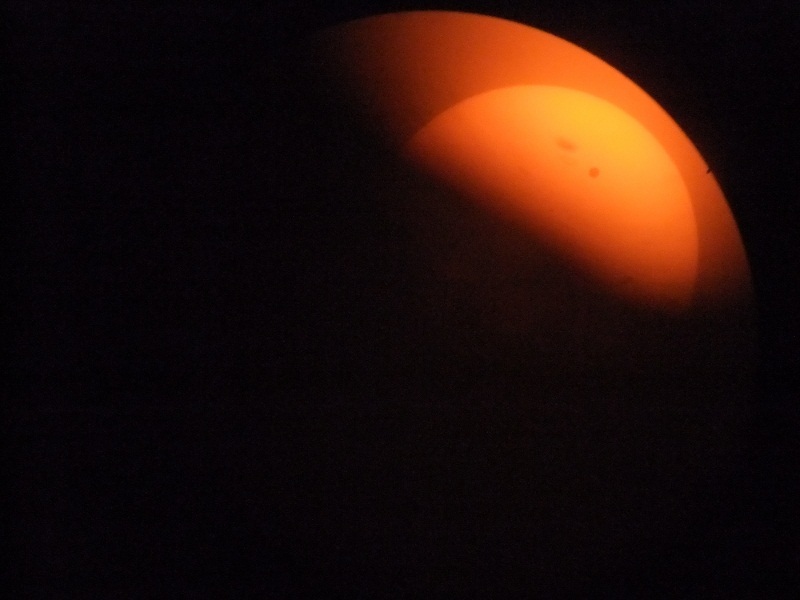 After two days of walking past with our curiosity teeming, we finally gave in and slowly opened one of the sliding wooden doors to take a peek. 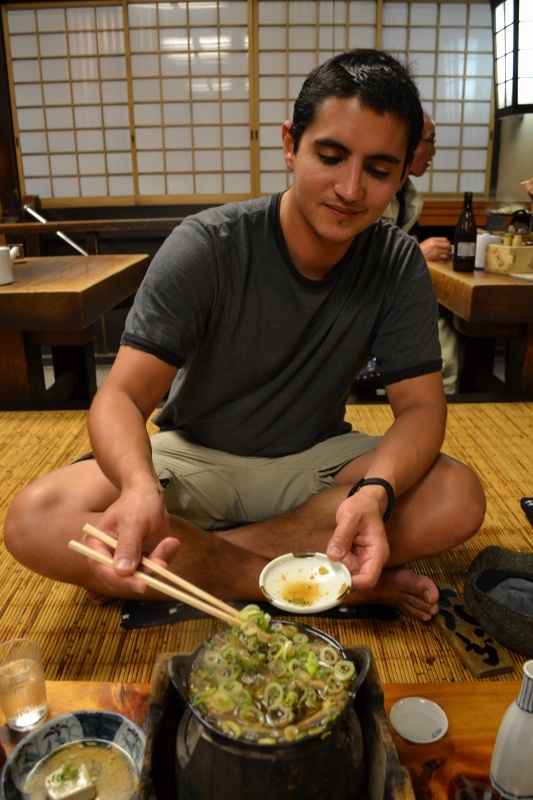 Inside, we found several tables of people sitting on tatami mats and enjoying traditional Japanese cuisine. 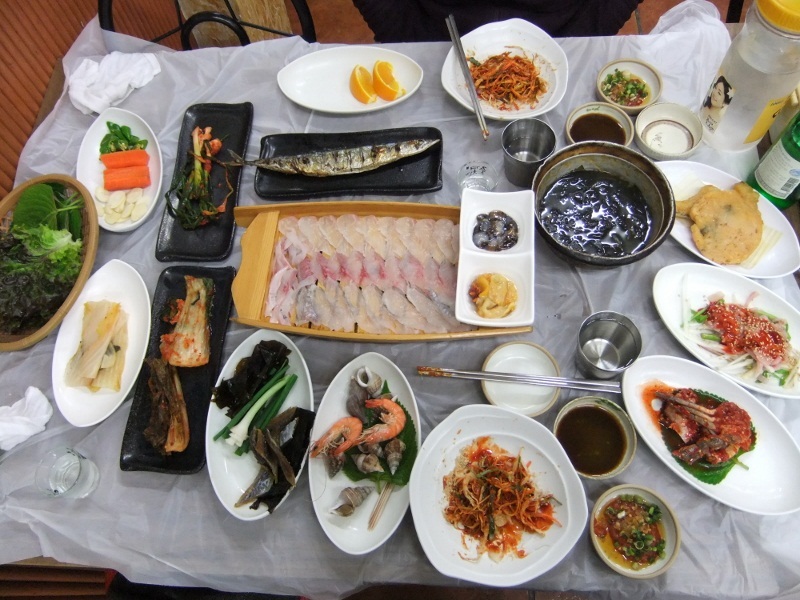 The menu wasn’t well translated, so we did what we normally do in that type of situation – we smiled and pointed to the dish that everyone else was eating. Turns out the dish is called “Dozeu-nabe” (this website describes the dish pretty well). 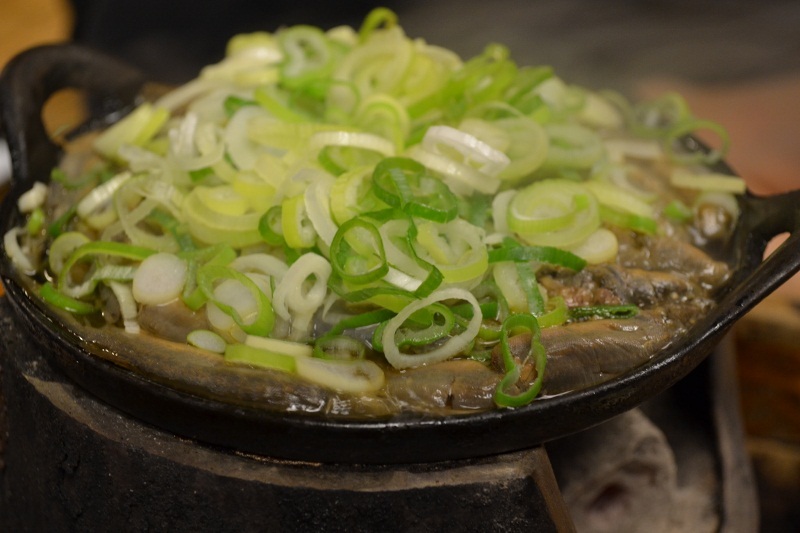 The dish was composed of small river fish that had first been cooked in sake and then transferred to a shallow metal dish. The fish then simmered over hot coals with green onions and fermented soy sauce on top. 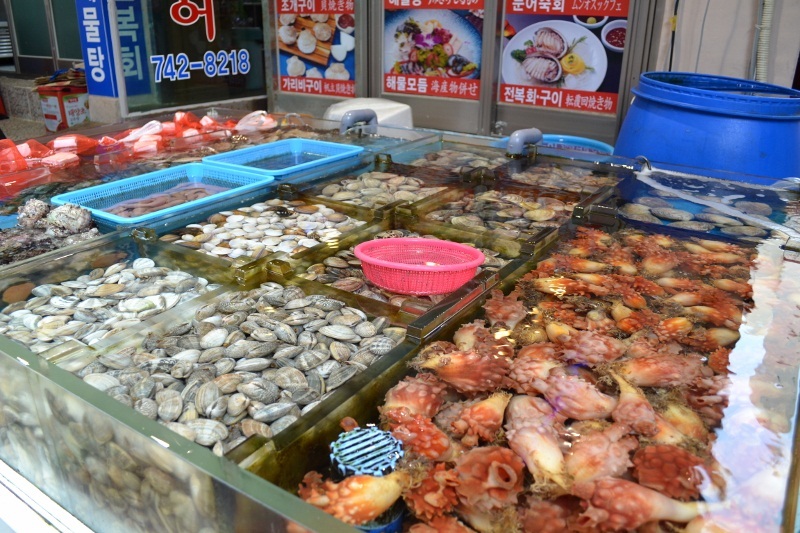 The preparation method softens the fish so that they can be consumed whole, bones and all. When the waitress first brought the dish to our table, our faces must have looked hilarious, as it didn’t look too appetizing. She graciously showed us how to properly prepare it. Halfway through the meal, she stopped by to tell us that one of the cooks was very impressed after observing our chopstick skills and Japanese dining manners. We always try to be culturally conscious travelers, and it was nice to hear that our efforts are appreciated! In the end, we could not have been more satisfied. Dozeu-nabe is delicious, and we were thrilled at the authenticity of dinner that evening. 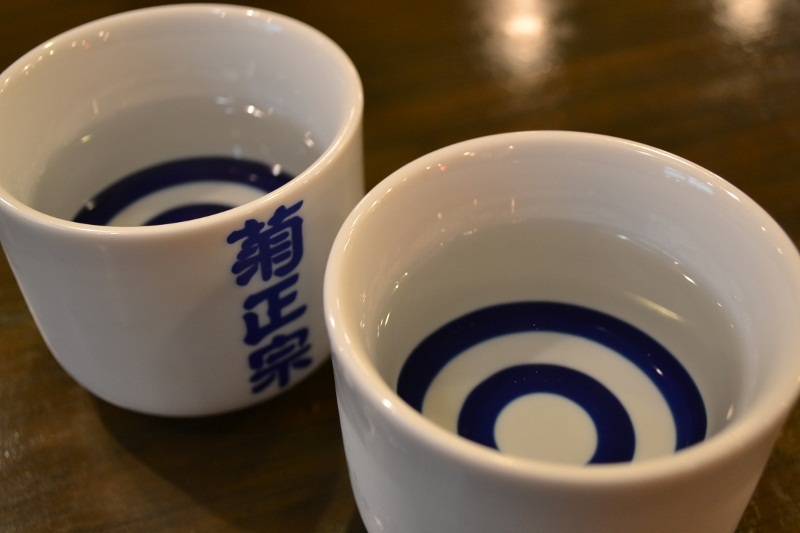 Visiting an izakaya (sake den) was on our must-do list upon arriving in Tokyo. 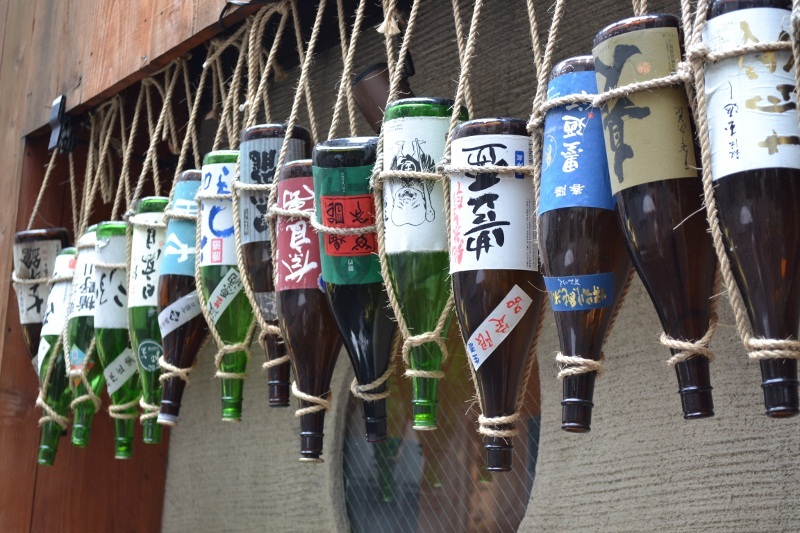 These Japanese style pubs are where the locals relax, loosen their ties after work, and often get helped out the door by a waiter as they stumble with an arm over their friend’s shoulder. 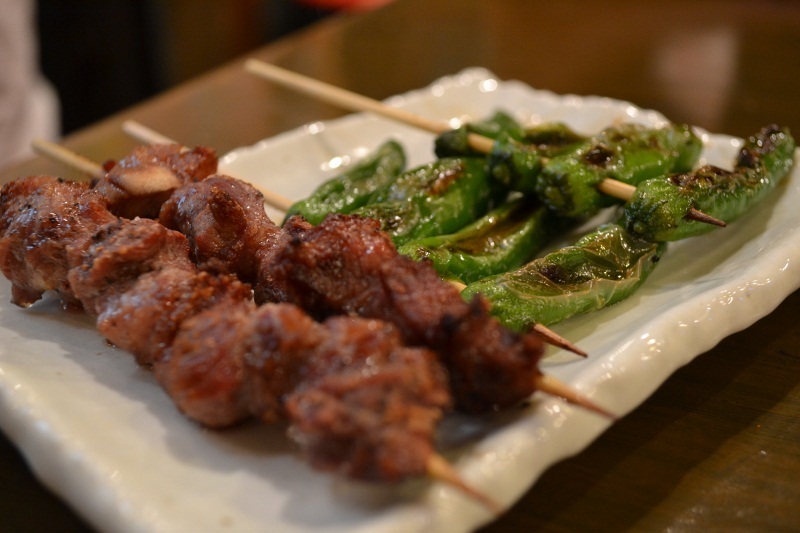 Following our tatami-style dinner, we made our way to a nearby izakaya that served up delicious tapas (for lack of a better word), meat skewers and generous glasses of sake. After six large cups of refreshing cold sake, a sampling of pork temple and chicken liver, and some great people watching, we were set for the night and made our walk home with nothing but smiles on our faces. The good thing about spending at least three days in a city is that it gives you the opportunity to truly experience the local cuisine by eating nine solid meals. 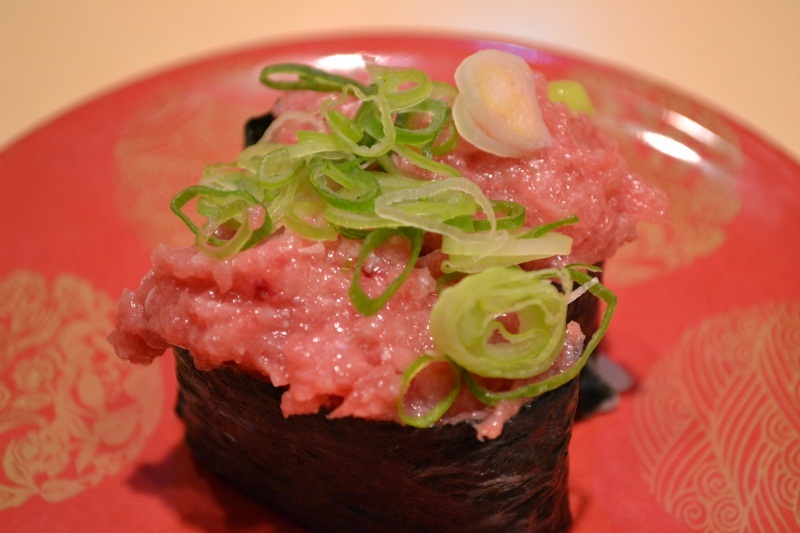 Between our tatami dinner, visit to the fish market, sake den experience, and many more meals, which we did not include in this post, we felt as though we had a good grip on the Tokyo food scene. As we mentioned, we left Tokyo wanting to see and taste more, and we will certainly be back someday. Don’t worry, our trip around the world isn’t over yet! 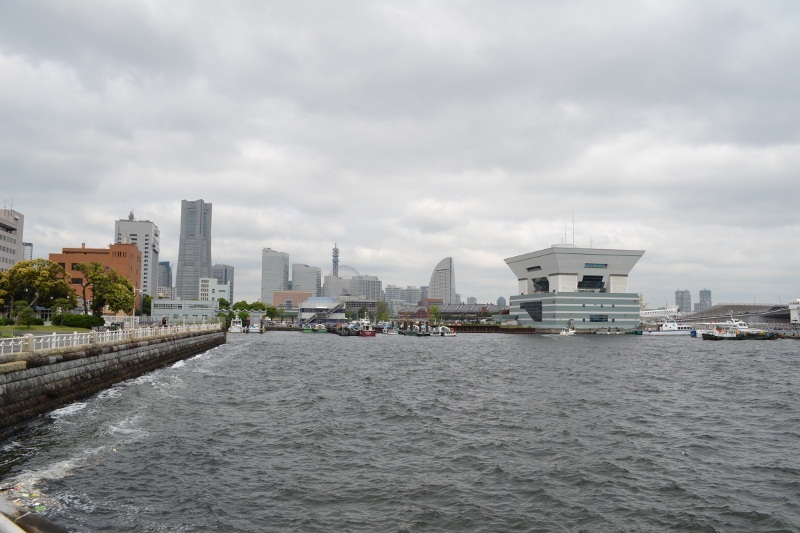 We just had some business to take care of in Yokohama, and our return to work was only temporary. It had been six months since we last set foot in a working environment (sob story, we know), but to be honest, we were a little anxious about going back to work. In true business traveler fashion, we took the Shinkansen high-speed train from Kyoto after sightseeing there for a week. You have to have a job to take this train, as the two hour ride costs nearly $150/ticket! 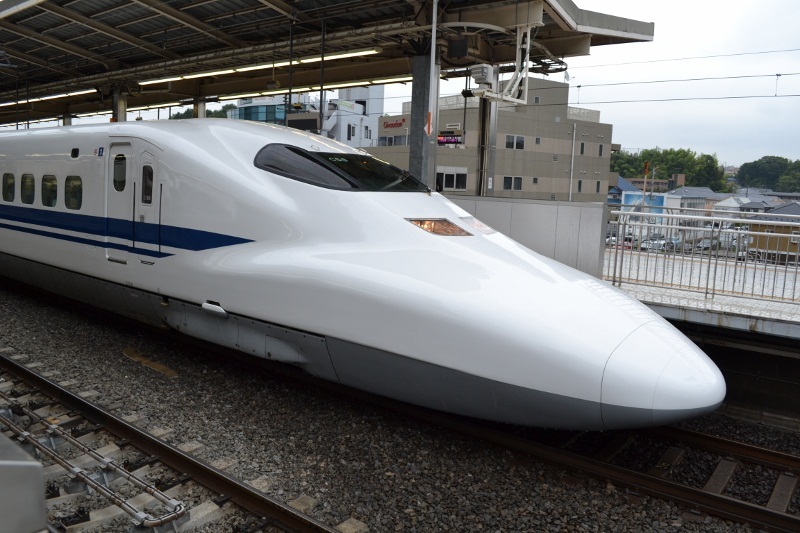 The Shinkansen (a.k.a. bullet train) that we rode from Kyoto to Yokohama reached speeds over 300km/hr! When we arrived in Yokohama, we traded in our backpacker wardrobe for business attire and prepared ourselves for four days “on the clock.” Spending several hours ironing clothes is not our idea of a fun first night in a new city, but getting dressed up in clean, pressed business attire actually felt quite refreshing. When you’ve been living out of a backpack for months on end, new clothes feel like a new car. First day back at work! We were in town for the 10th Annual ISSCR Stem Cell Research Convention, which brought together researchers from around the globe. 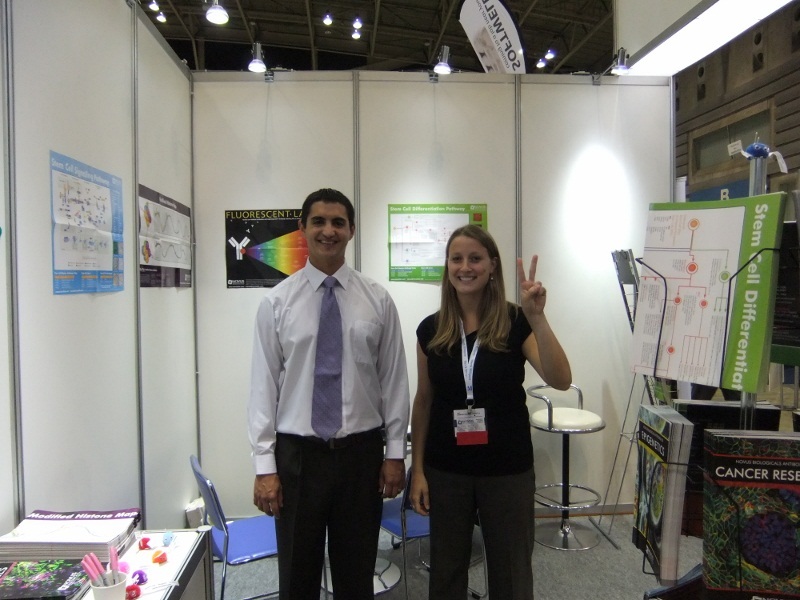 We were working as private contractors manning the booth for Novus Biologicals, Amy’s former employer in Colorado. 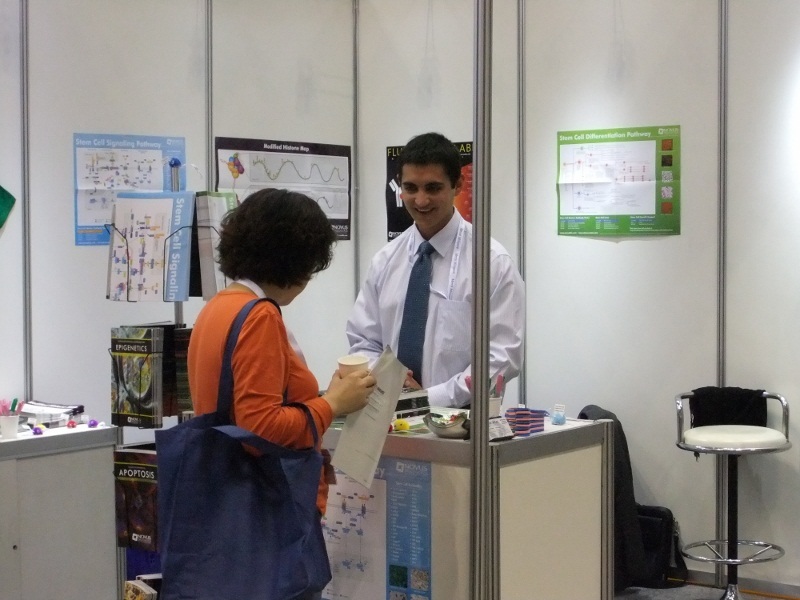 Our job was to let researchers know about antibodies and other related products that may be useful to their stem cell studies. 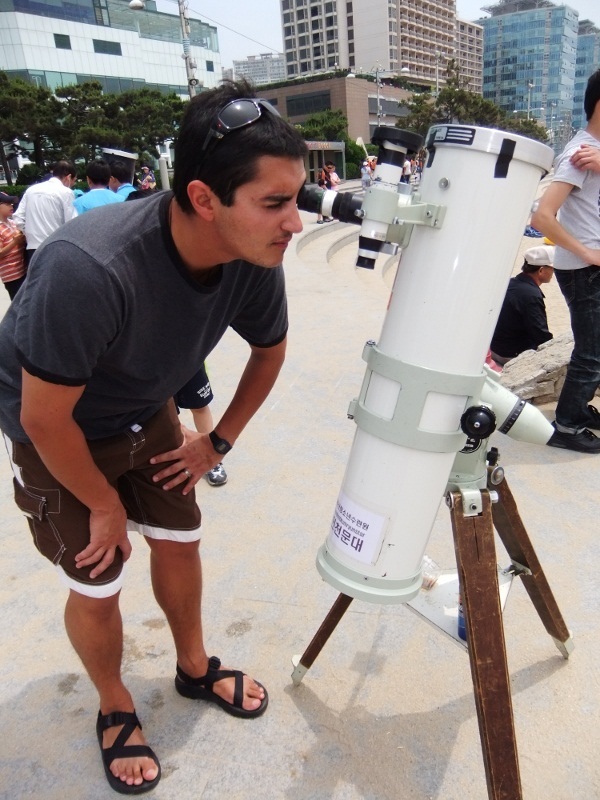 Amy has worked numerous such conventions in the past; for Mike it was a brand new experience. He got a crash course in antibodies before arriving in Japan and did a stellar job with his science lingo. Thank you, Novus, for the opportunity to work ISSCR! 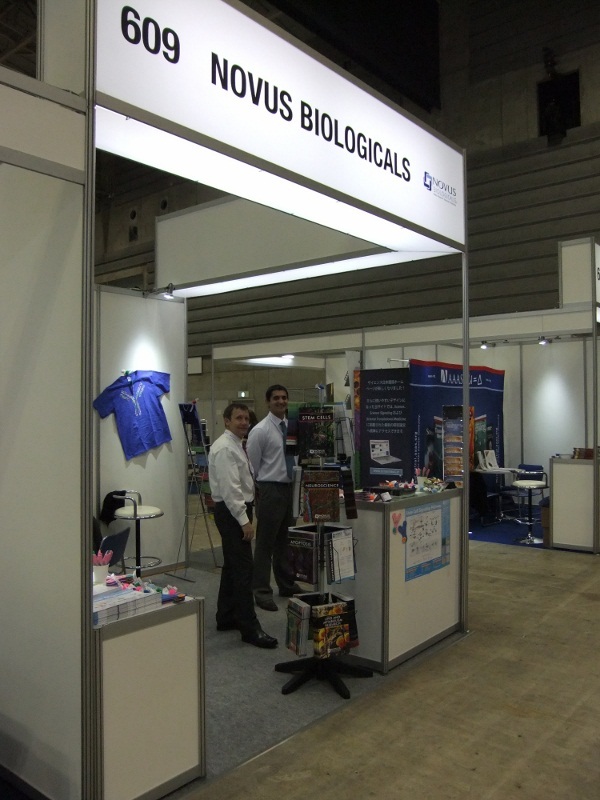 The Novus booth was our home for four days in Yokohama. 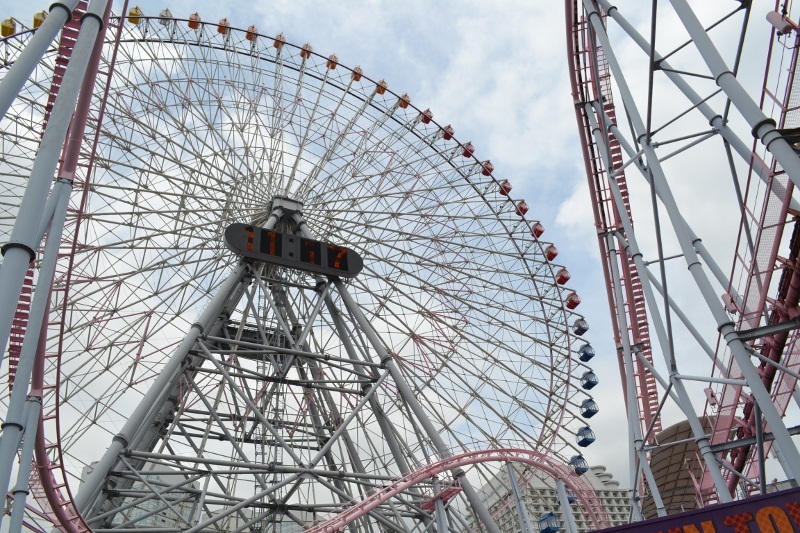 The event took place at the PACIFICO Yokohama. 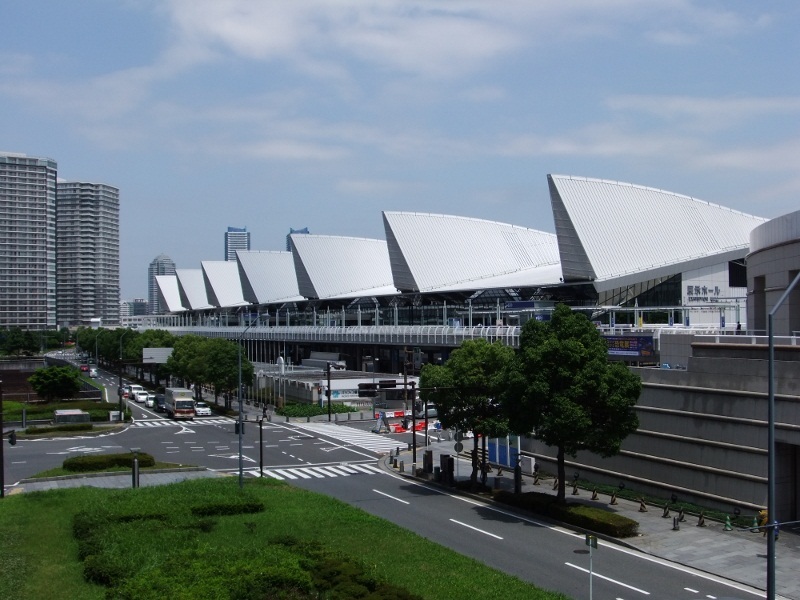 This convention center is situated along the water and near some great restaurants and parks in Yokohama. We were lucky enough to have a bit of time to sightsee before and after ISSCR. This amusement park is situated right next to the convention center, which made it easy for us to take a roller coaster ride before the first day of the show! Our hotel was located just a few blocks from Chinatown, one of the largest of its kind in the world, which provided for some great people watching and delicious meals, and the hectic vibe actually brought us back to our recent travels in China. We seem to be ending all of our posts recently by talking about food, so we may as well keep with the trend. No business trip is complete without a fancy business dinner. 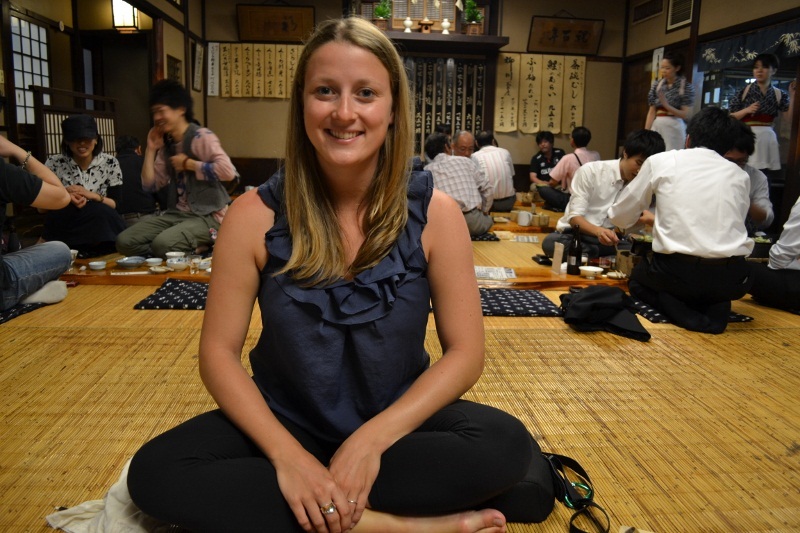 We enjoyed an incredible Kyoto-style dinner one night with Amy’s former boss and a Japanese distributor. With ten courses, three types of sake and good conversation, it was a real treat to say the least. 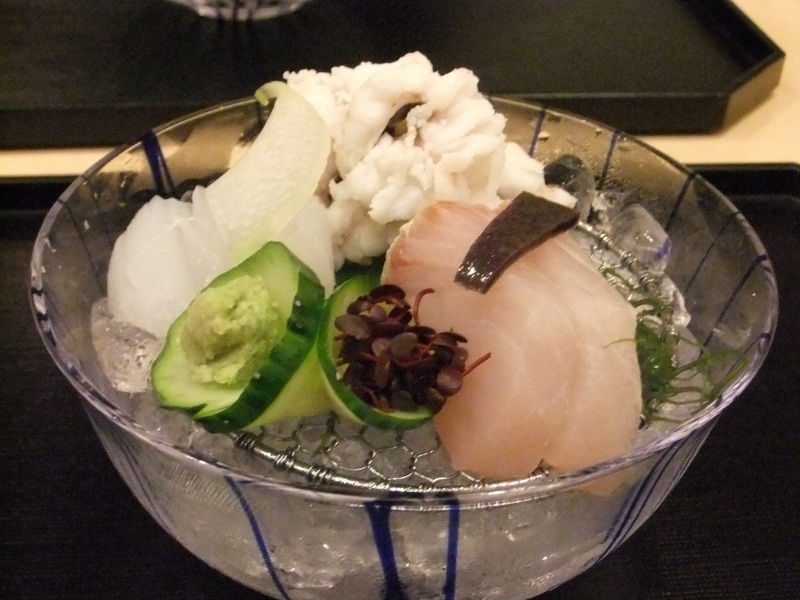 2nd Course: squid, pike and sashimi served on ice. All in all, going back to work went very smoothly. It was a good reminder of the hard work we did to make our dream of traveling the world come true. So for now, it’s back to life on the road and doing the work that we love, blogging about our travels. 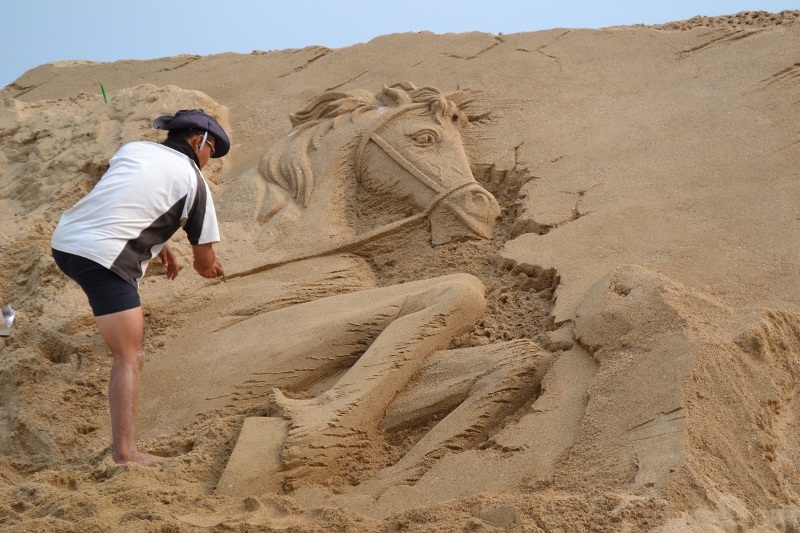 Who knows what the future will hold; we are focusing on living life in the present. One of the first things that any traveler will notice about Kyoto is that there appears to be a temple or shrine on nearly every block. That may be a bit of an exaggeration, but Kyoto’s reputation as the home of traditional Japanese culture is well deserved. 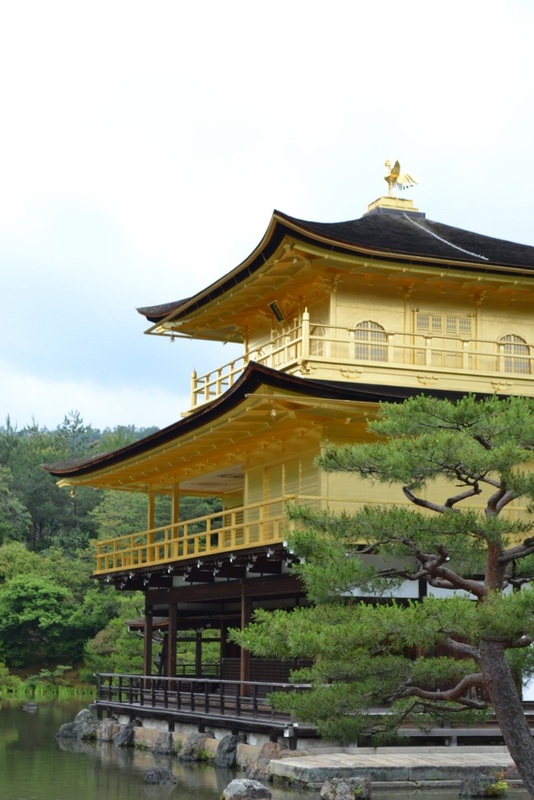 Once the Imperial Capital of Japan, Kyoto is now a modern city where the traditions of the past live on. In the midst of crowded, multiple-story malls, you will find a number of women shopping in traditional Japanese Kimonos, and when you exit the mall, you are likely to find monks worshiping at a temple just around the corner. 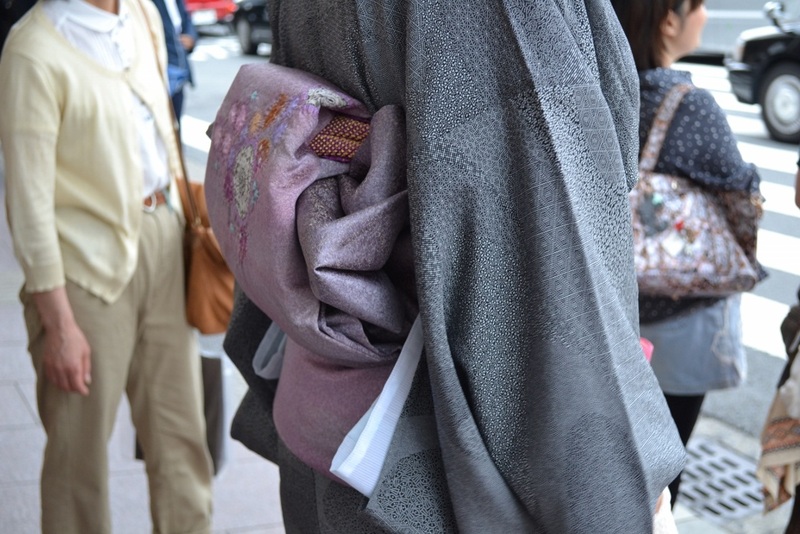 Kimonos are a common sight in Kyoto. We spent our week in Kyoto visiting only a handful of the many temples and shrines, but the ones we did visit were magnificent. From the moment we set foot in Japan, we were truly humbled by the kindness and respect that people show one another. Even those who have never traveled abroad would feel safe and welcome in Japan. Nonetheless, it was helpful to have a Japanese-speaking guide to get an insider’s perspective on the culture of Japan. Our friend, Patricia, who lives and works in the Shiga Prefecture, met us in town one day to show us around to Kinkaku-ji (The Golden Temple) and Fushimi Inari Shrine. It made the experience that much more authentic. Enjoying a tasty tempura and noodle lunch in Kyoto with Patricia. Thanks for a fun day! The temple is coated in gold leaf, similar to the dome on the capital building in Denver. 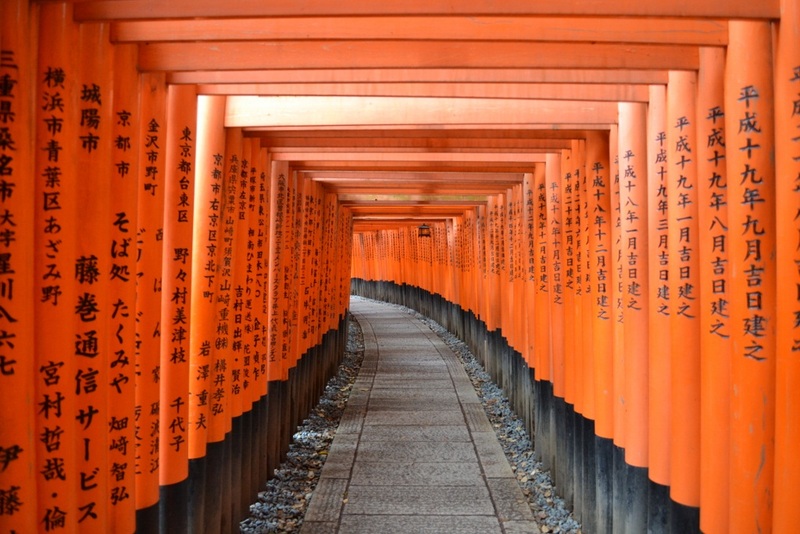 The gates of Fushimi Inari Shrine wound on and on for miles. Each one varies in size and bears the name of the individual or group that purchased it. 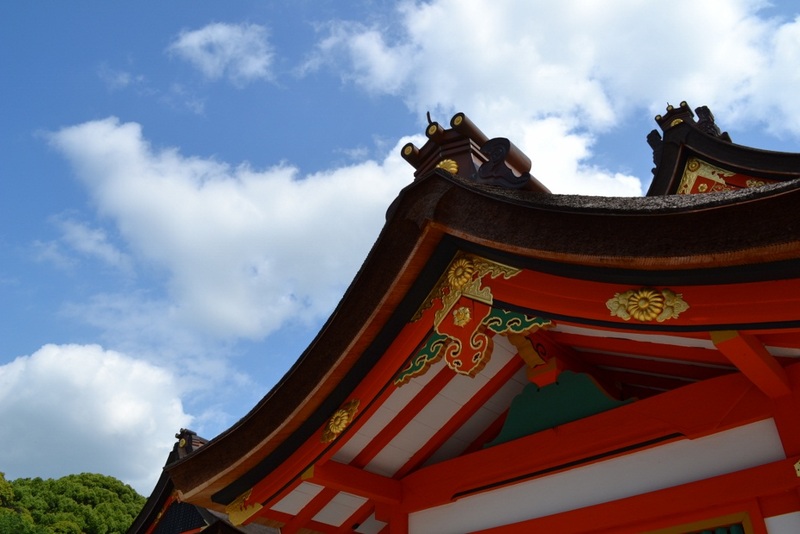 The foremost structure at Fushimi Inari Shrine. 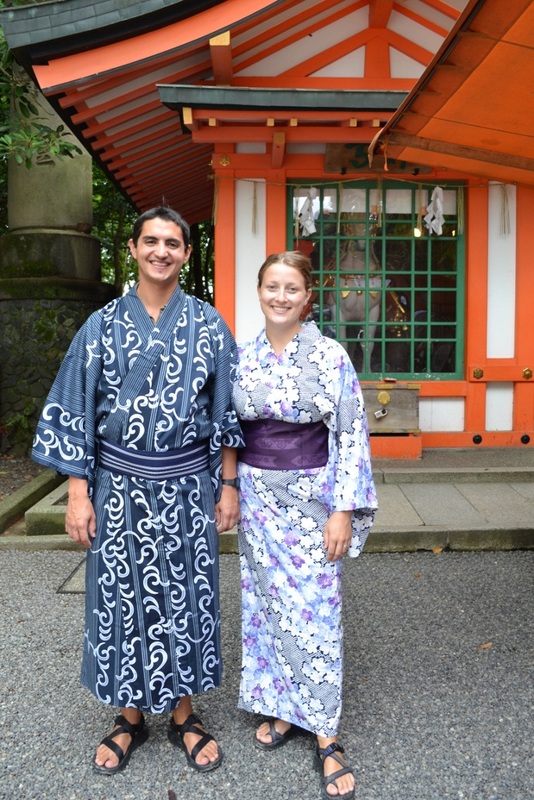 Before walking through the network of orange gates at Fushimi Inari, Patricia convinced us to dress up in traditional garb at a kimono vendor’s stall. We had no intention of purchasing kimonos, but after we got all decked out, the thought crossed our minds. While they would have been fun Halloween costumes, we eventually realized that they would have collected dust 99% of the time. 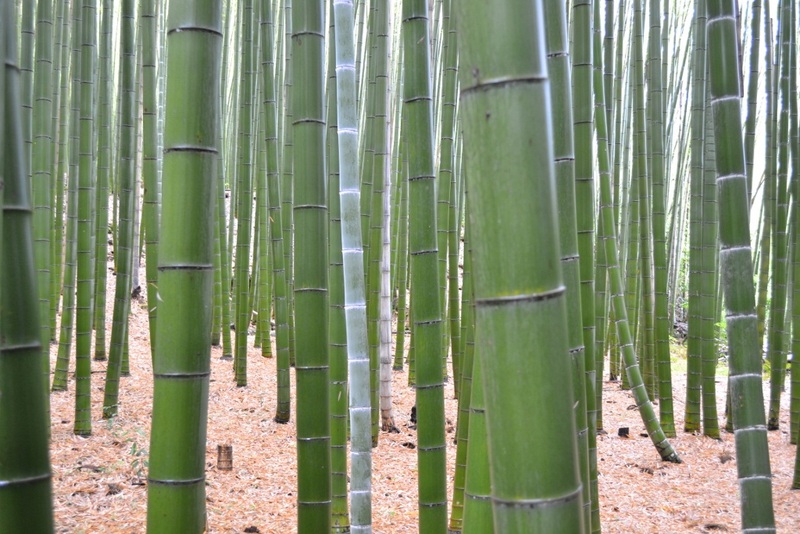 Another highlight of our visit to Kyoto was our trip to Arashiyama. We learned about this neighborhood of town from our hostel’s “things to do” board. At a first glance, it seemed like nothing more than something to do on a rainy day; however, it turned out to be one of our favorite places in Kyoto. 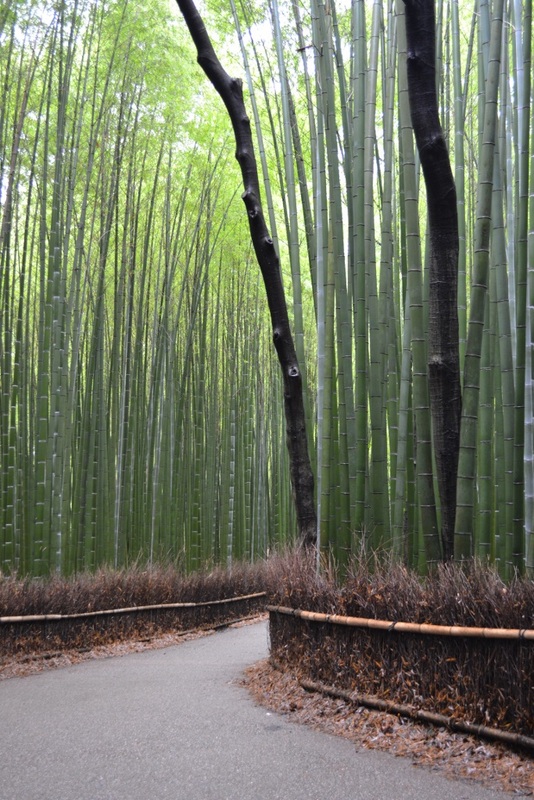 The paths that make their way through the area are canopied by a forest of bamboo. Seemingly endless grove of bamboo trees. The trees towered so high that they drooped over the path to create a natural canopy. Last but not least…the food. 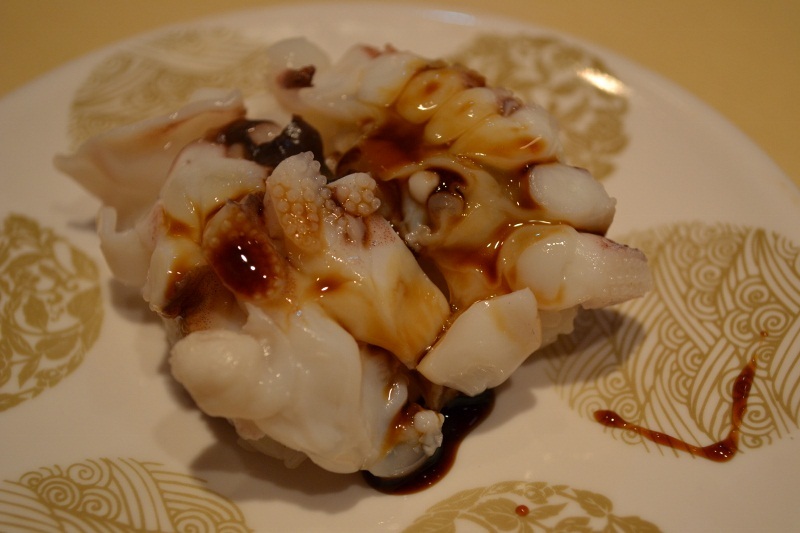 A post on The Chamborres Expedition is not a post without writing about the cuisine of a city. We took a suggestion from a friend and sought out a grocery store located in the basement of a department store. We know that doesn’t sound like an exciting culinary adventure, but trust us, some of the best and most affordable sushi in the world can be found in such places. 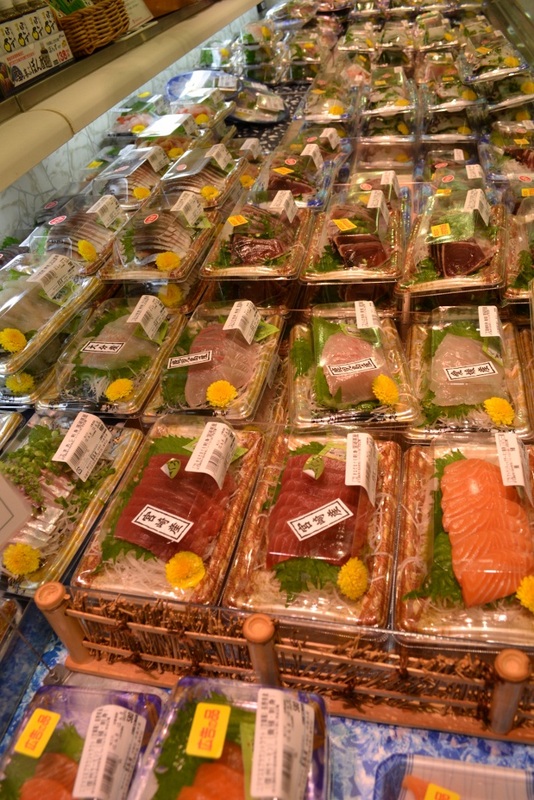 We scoped out our dinner selection early one morning, but lucked out by returning after 6:00PM when much of the sashimi was marked down 20 and 30 percent. No one wants day old sushi. Everything in Japan is an art form, even the desserts. 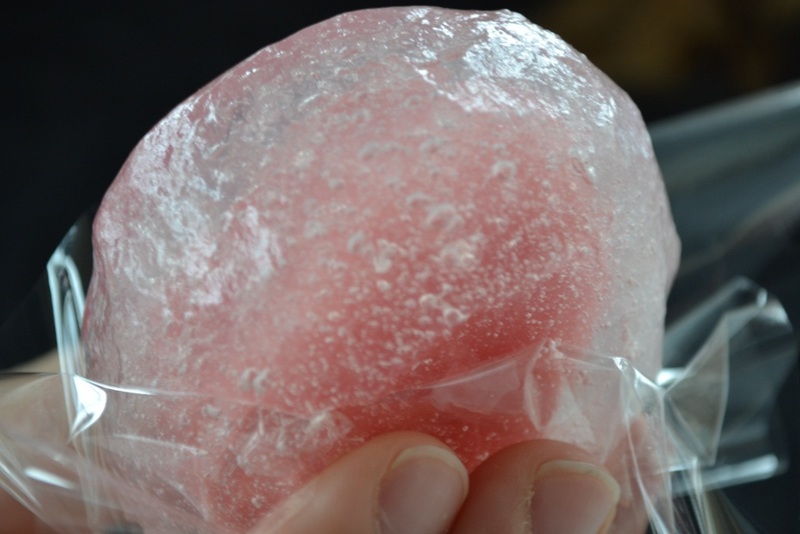 We were continually impressed by the presentation of products in the artisan sweet shops. The colors, textures and designs are a treat to the eye. 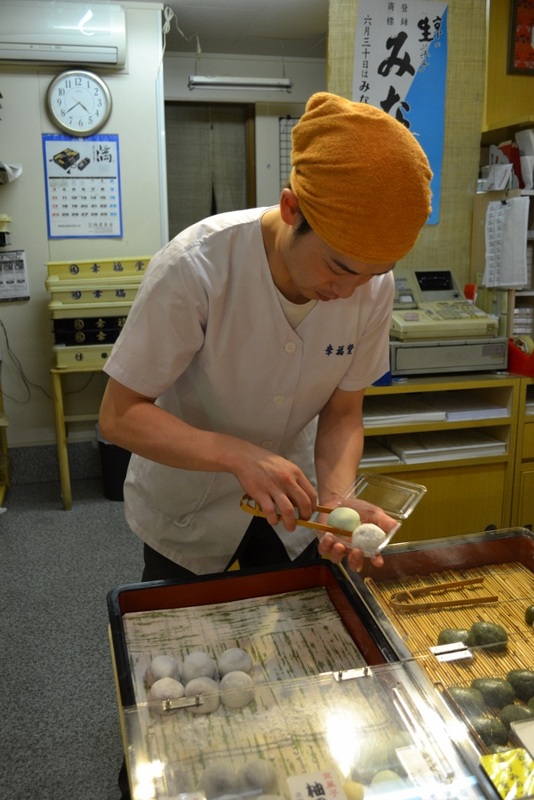 Having only known the deliciousness of mochi from home, we were amazed by the taste and freshness of the ones in Kyoto. At over 150 yen/piece, they are not cheap, but they are an incredibly delicate and subtle way to end a meal. Yesterday, we overheard another traveler saying, “I am so happy, it was something I have always wanted to do.” That is exactly how we felt when we arrived in Kyoto. 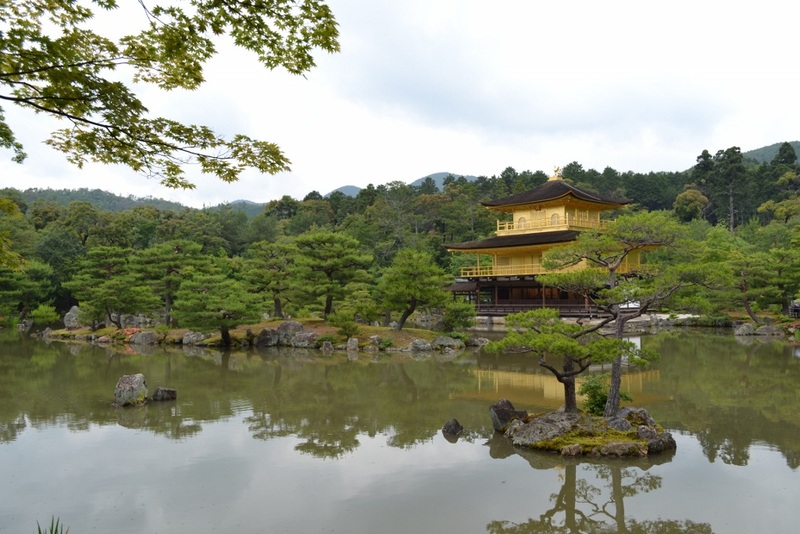 We have always wanted to visit Japan, and exploring Kyoto was the perfect way to start our visit. It allowed us to see the temples of old, experience the food of today, and get a glimpse of the trends of tomorrow that awaited us in Tokyo. 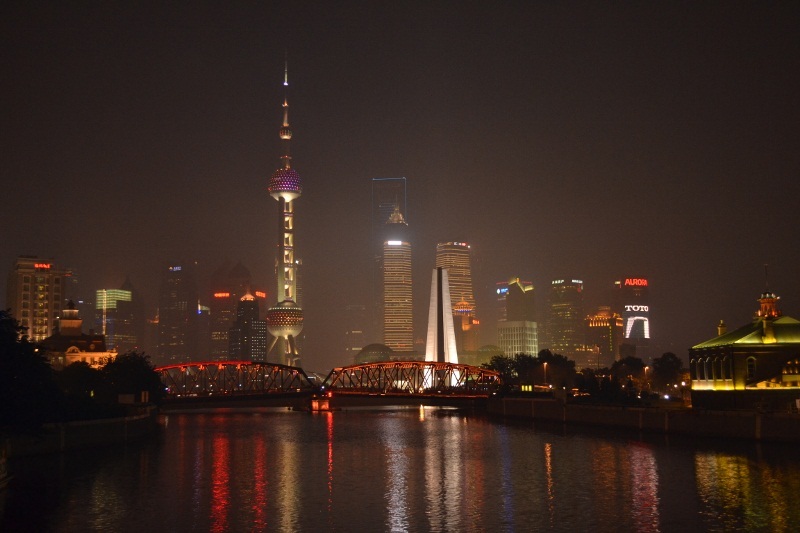 Before diving into Shanghai itself, we must talk about how we got there. There are many ways to get from place to place in China; for the budget backpacker, overnight trains are the best option. We opted for “hard-sleeper” beds, which, as the name would suggest, are quite firm and stacked three-high in a car without doors or curtains; basically a moving bunk room with 70+ beds. While it’s not the most private way to travel, it is actually quite fun! Small tables and folding chairs line the corridor, making for a very communal feel. 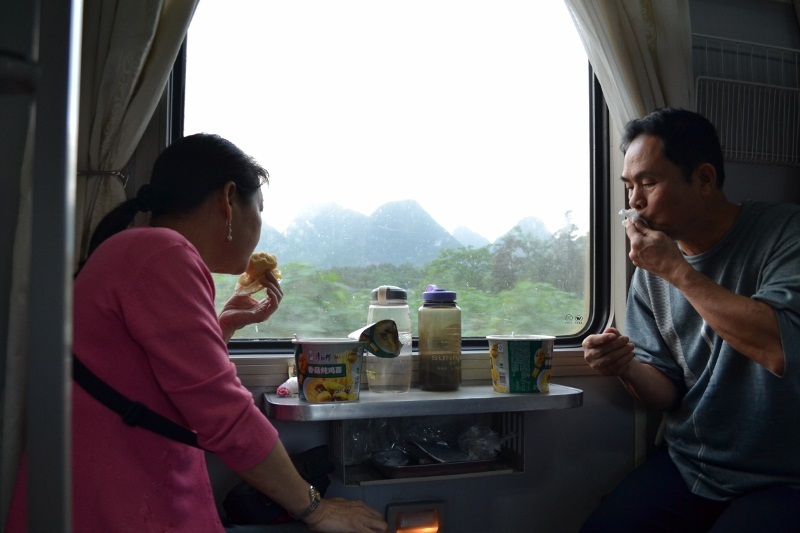 All of the train cars are equipped with steaming hot water taps, and we learned early on that dried noodle bowls are the meal of choice for long train rides. Add a deck of cards, a good book and a flask of whiskey to the mix, and you’re set with all you need to make the most of the 23 hour, 950 mile journey. I’m on the night train! Our bunk mates eating the standard Chinese night train fare of cup-o-noodles. We spent our first day in Shanghai visiting the Shanghai Propaganda Poster Museum. It has to be one of the most oddly located museums in the world. 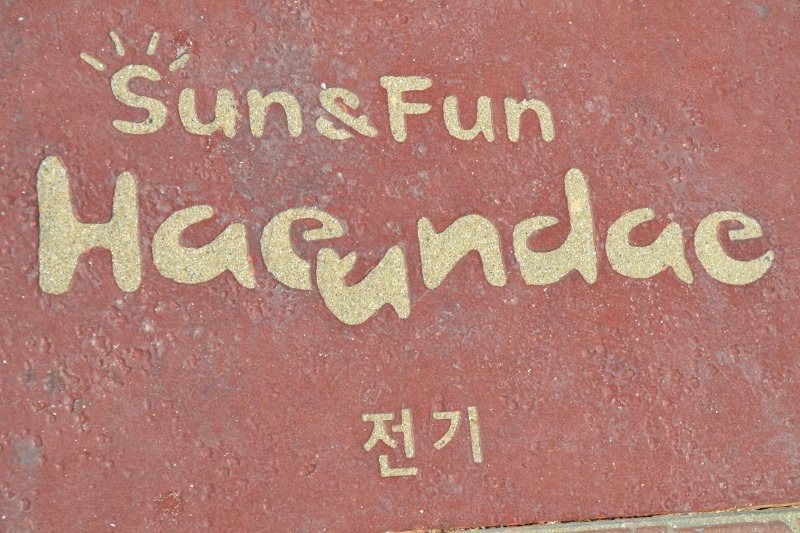 With the address and Chinese name in hand, we arrived at what we thought was the entrance. 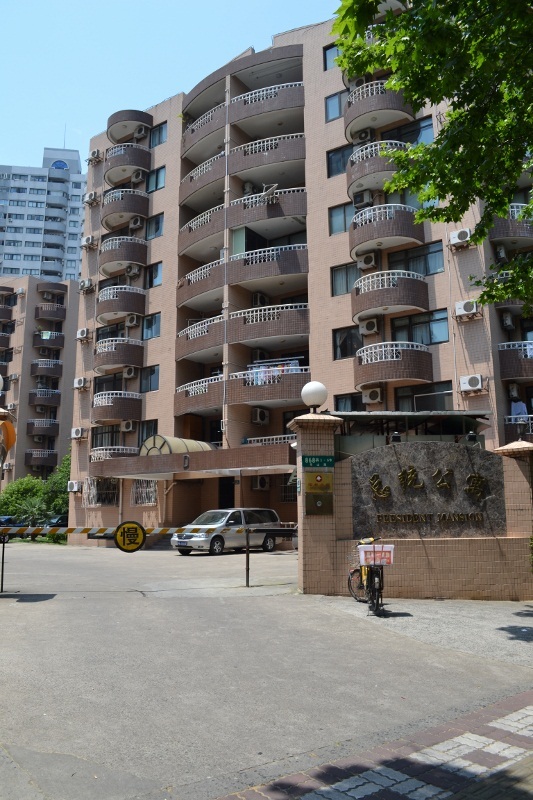 At first, we weren’t certain we had found the right place as it was just a big apartment complex. The security guard handed us a business card that pointed us around the corner and down a floor to the basement of building #3.
Who would have thought this was home to Shanghai’s Propaganda Poster Museum? 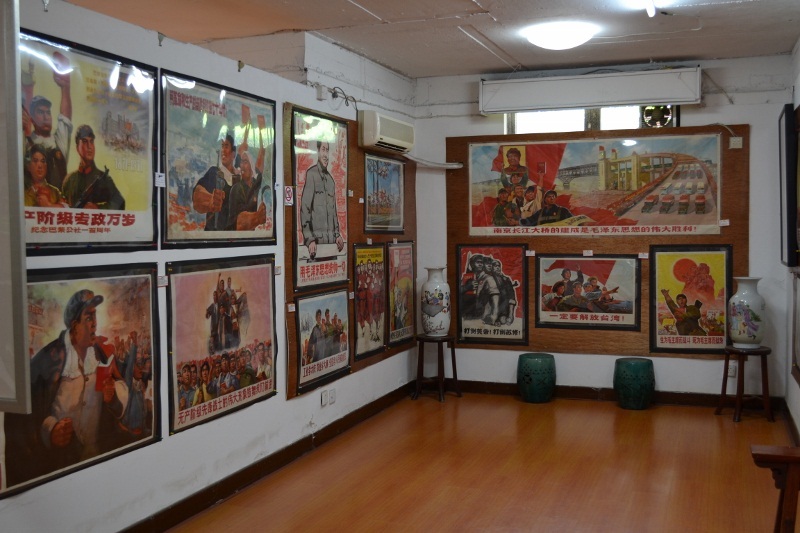 The museum houses a very extensive collection of original Chinese Communist Party propaganda posters. Almost all of these posters were destroyed following Mao’s death, so a collection this size is quite remarkable. The dates of the posters range form 1930-1979; the imagery and verbiage used on the posters are both powerful and thought-provoking. We highly recommend visiting this museum on your next stop in Shanghai. “Grandpa Mao” as they refer to him in China. Possibly Shanghai’s most well know attraction, The Bund, is a historic part of city with predominantly European architecture. It was home to many important residents, businesses, and government offices during the British rule of the city. Today the area is a meeting ground of old and new. Sitting just across the Huangpu River from The Bund are countless ultra-modern skyscrapers that fill Shanghai with neon lights each evening. For us, the view was somewhat reminiscent of Hong Kong, but let there be no mistake about it, Shanghai is mainland China through and through, not an SAR. 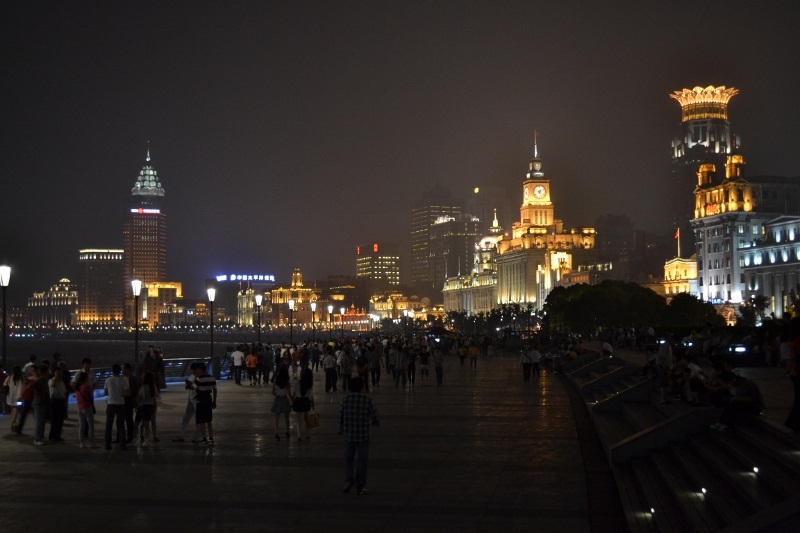 View of the Pudong skyline (East bank of the Huangpu River) from The Bund. Another remnant of Shanghai’s colonial past is the neighborhood known as The French Concession. Its wide, tree-lined boulevards, well-kept mansions and designer fashion stores transport you far from the chaos of the city center, and can almost convince you that you are in Europe not Asia. 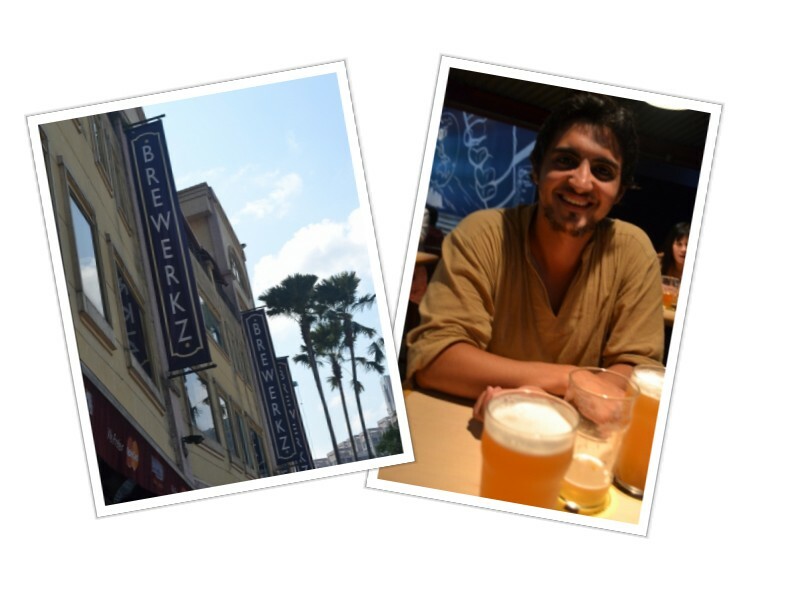 We strolled through the area one afternoon and stumbled upon something we had been missing since we left home, a micro-brewery. Yes! 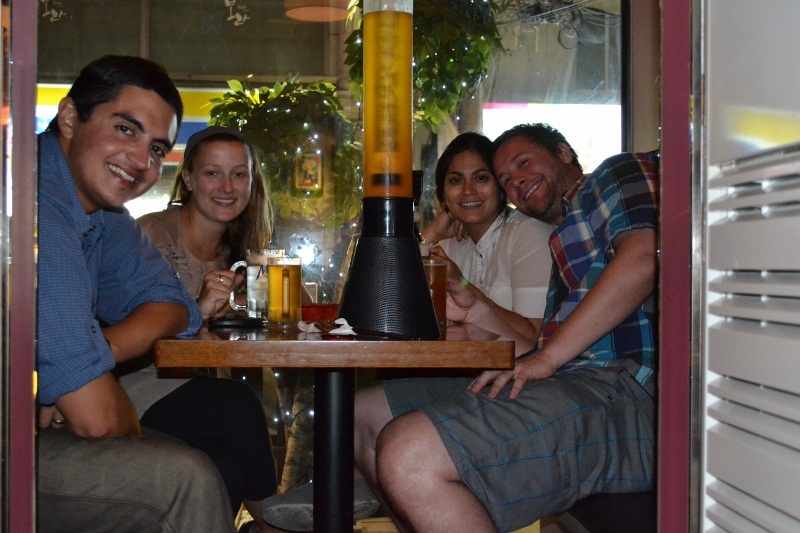 Any cold beer goes down easily on a hot, humid day, but the beer in China leaves a lot to be desired. Being from Portland and Denver (the micro-brew hubs of America) we require a good craft beer from time to time; Boxing Cat Brewery in the French Concession fit the bill. 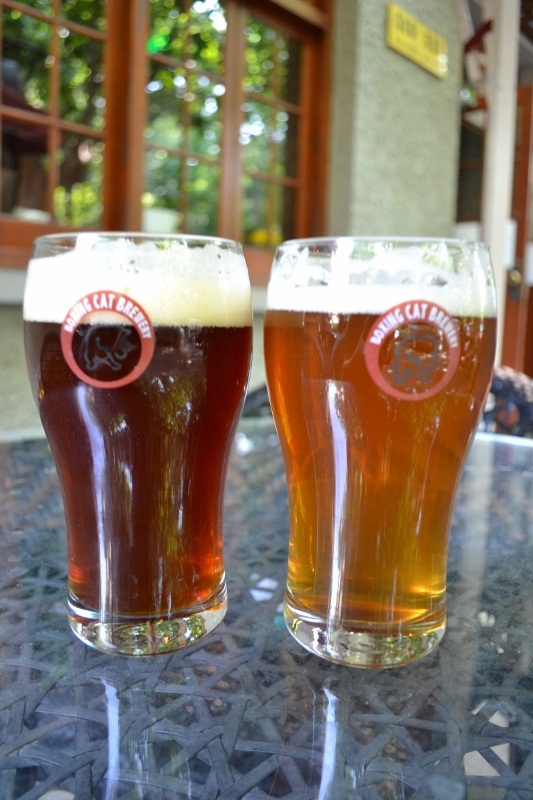 These red and pale ales tasted incredible to our taste buds after months of watery, light beer. 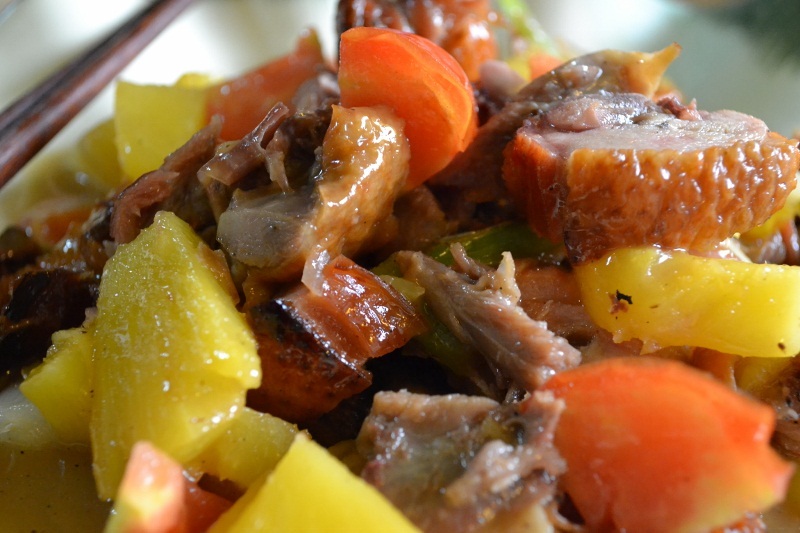 Each region in China boasts its own local flavor. 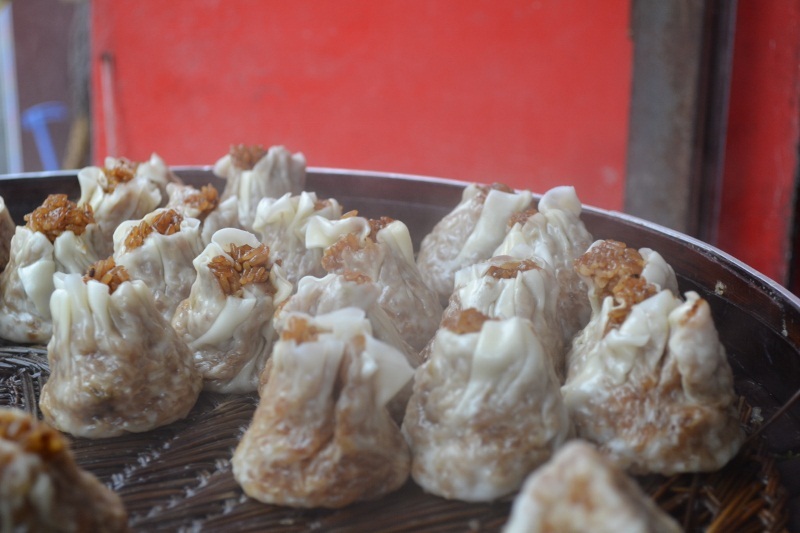 In Shanghai, the regional specialty is dumplings. Every restaurant and street cart sells their own version. We came to love the dumpling vendor on the corner next to our hostel, and stopped by every morning for breakfast. We never quite figured it out, but each day we paid a different price for the same dumplings. It seems that China is one of those places where you can decide what you’re going to pay for a product; hand the person your money with confidence and they will likely accept it with a smile. 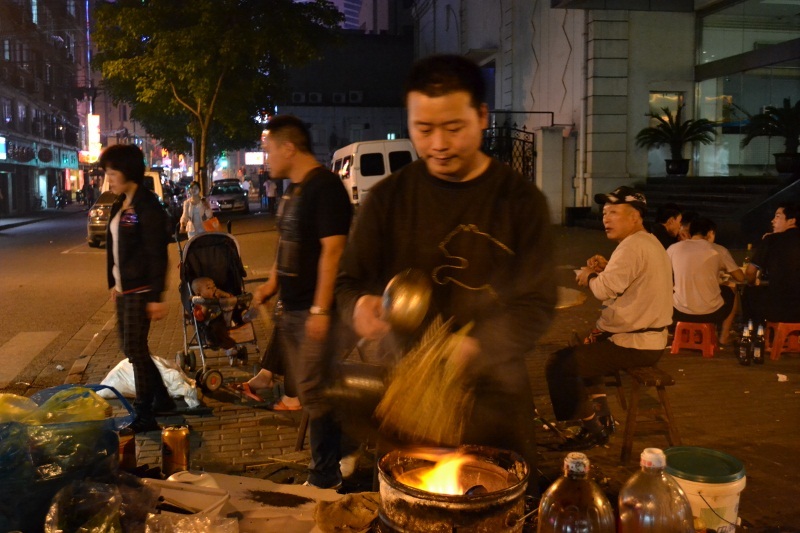 Beyond dumplings, we enjoyed many other delicious treats from vendors on the street in Shanghai. Some of our favorites were two well know dishes in the western world, fried noodles (chow mein) and fried rice (chow fahn) prepared on a makeshift, propane-powered stove top that was attached to a bicycle. Ready in less than two minutes, these dishes were phenomenal late-night snacks. Tasty chow mein, MSG and all. Last but not least, KTV. 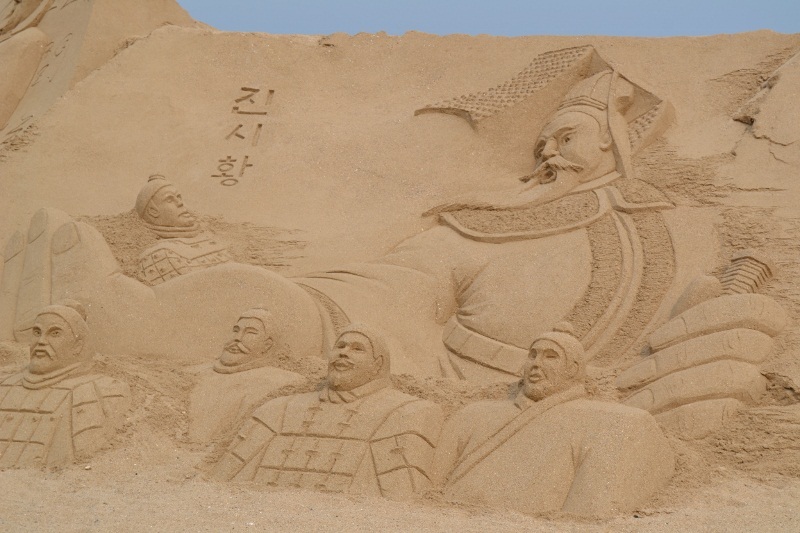 We had heard a lot about it since arriving in China, and were excited to partake in this beloved Chinese pastime. One Friday night in Shanghai we met up with a friend of a friend to see what KTV was all about. Essentially, it is karaoke, but is much different than the karaoke bars found in the US. Forget the dive bar with a large screen where you sing in front of a crowd of strangers. Now, picture walking into the lobby of a high-rise, heading up the elevator, exiting into a fancy corridor of numbered rooms. Behind each door: couches, a flat-screen TV, song selection computer, microphones, bottles of liquor, snacks, dice games and, most importantly, a good group of friends. 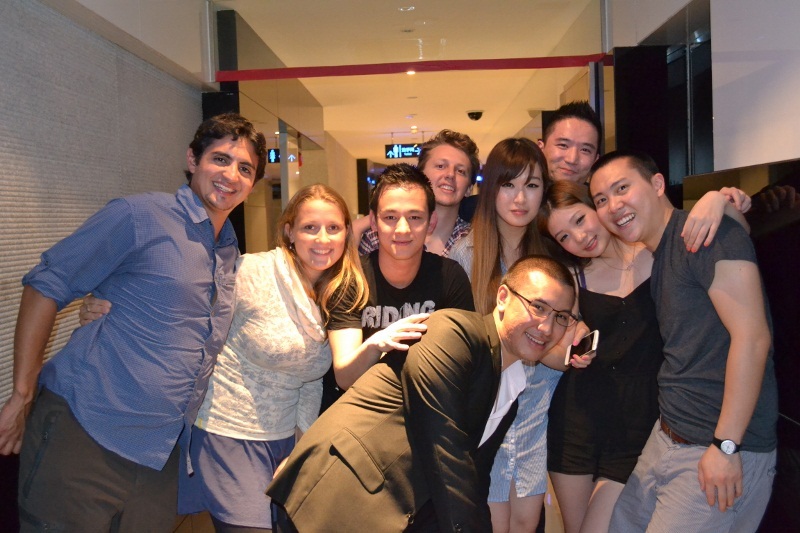 We stayed at KTV with our new Chinese friends until 4am, and it was truly a night to remember. Upon arriving at the dock in Yangshuo, we said goodbye to our boat full of new Chinese friends and set off for our hostel. 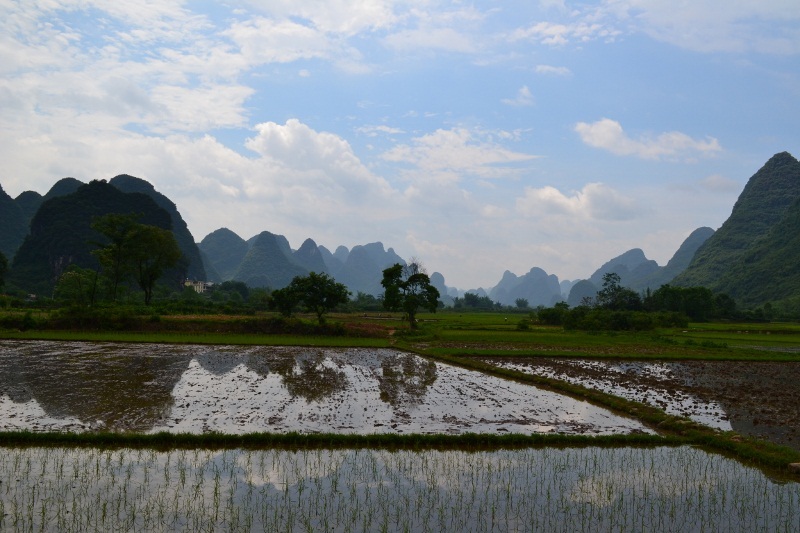 We heard many stories about the budget accommodations and even cheaper food to be had in China, but until Yangshuo, we had yet to fully experience them. Our hostel was awesome and we were shocked to find beds for only $2.50 USD. We instantly realized the cost benefit of traveling in China; no wonder so many backpackers flock to this region. Our one-year trip may have just been granted an extension. 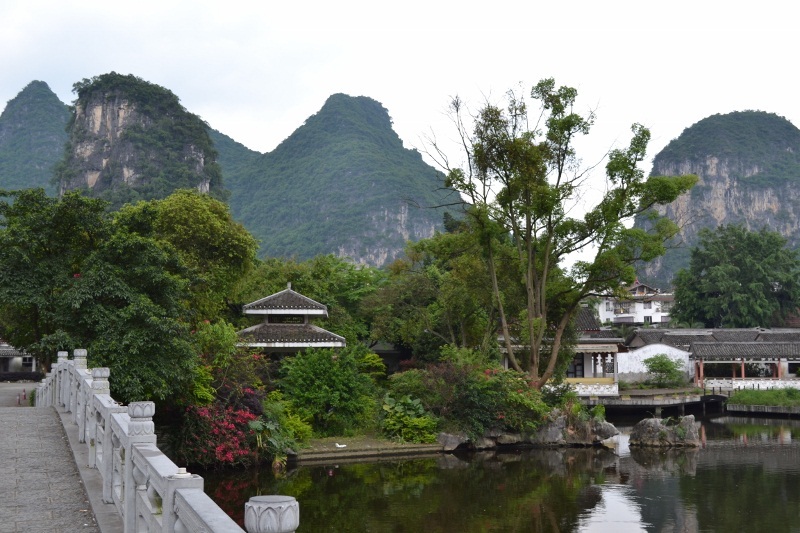 The center of Yangshuo with the spectacular karst peaks in the background. 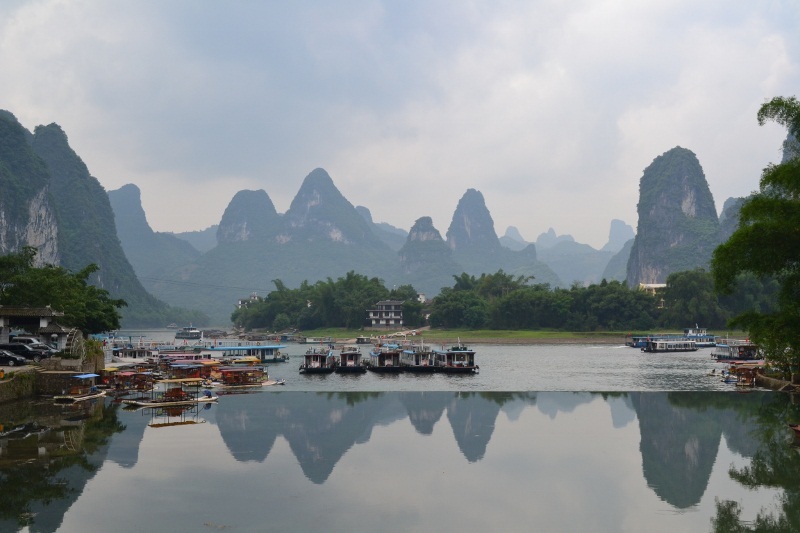 The cruise down the Li River offered spectacular views, and during our four days in Yangshuo we continued to be wowed by the magnificence of the limestone peaks. At home we spend much of our free time hiking and enjoying the outdoors, so naturally, we like to do the same while on the road. 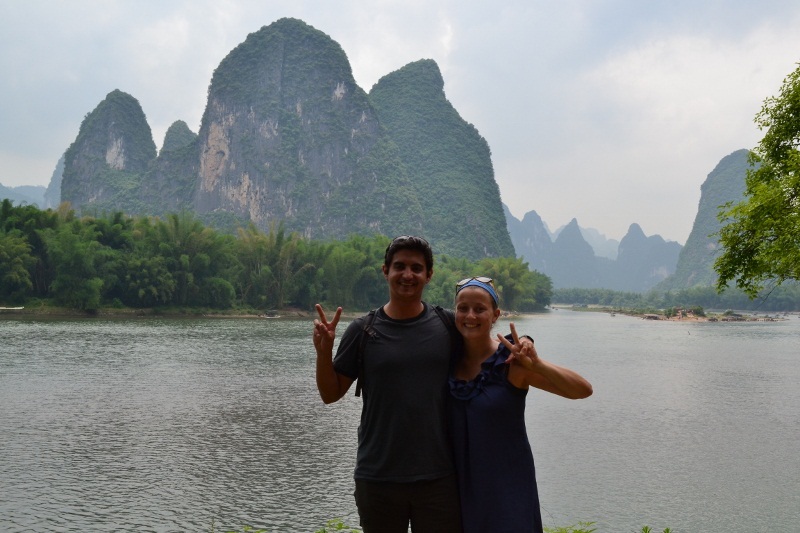 One of the best bike rides of our life happened in Yangshuo, through the Yulong River Valley. 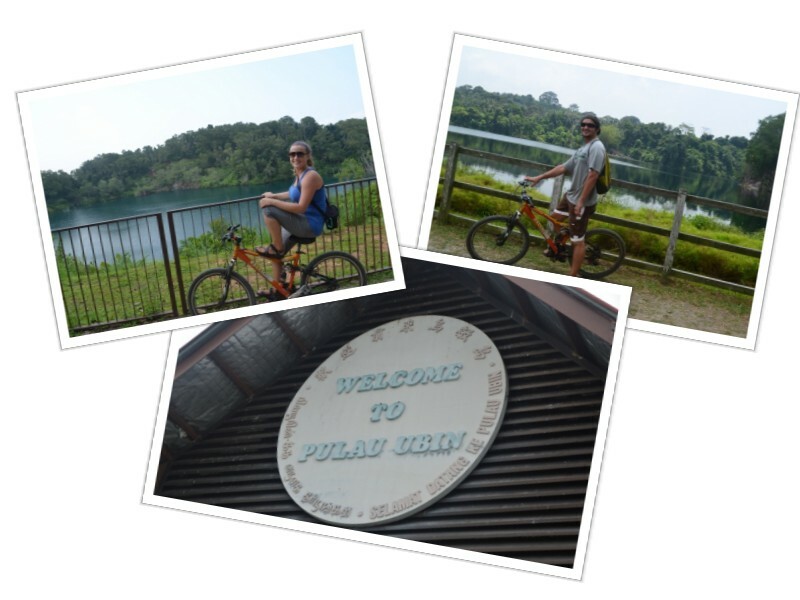 We cycled for 20km up and down the river on rocky paths exploring small villages, rice paddies, and the surrounding peaks. The farmers who live in the region work hard under the heat of the sweltering sun, but man do they live in a beautiful place. We found ourselves wondering if they realize that their home is situated in one of the most unique landscapes on the planet. 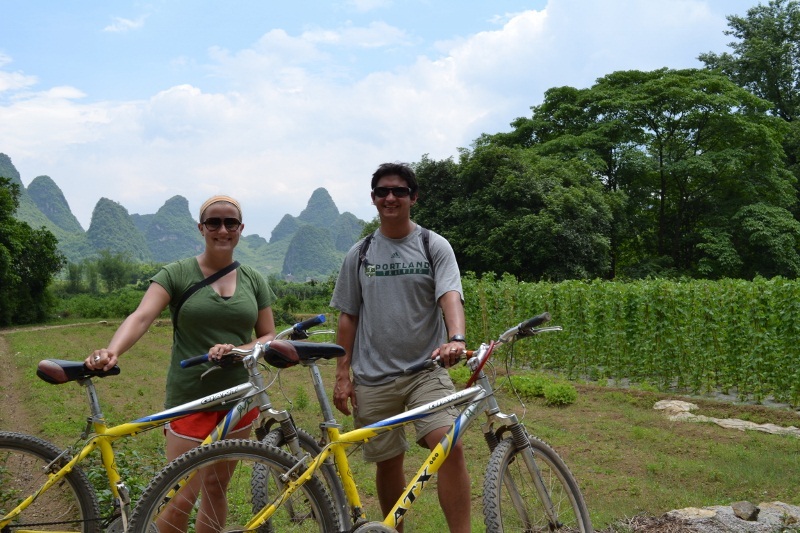 Adventure biking along the Yulong River. Glistening rice paddies. If you have to work knee deep in mud, this is the place to do it. 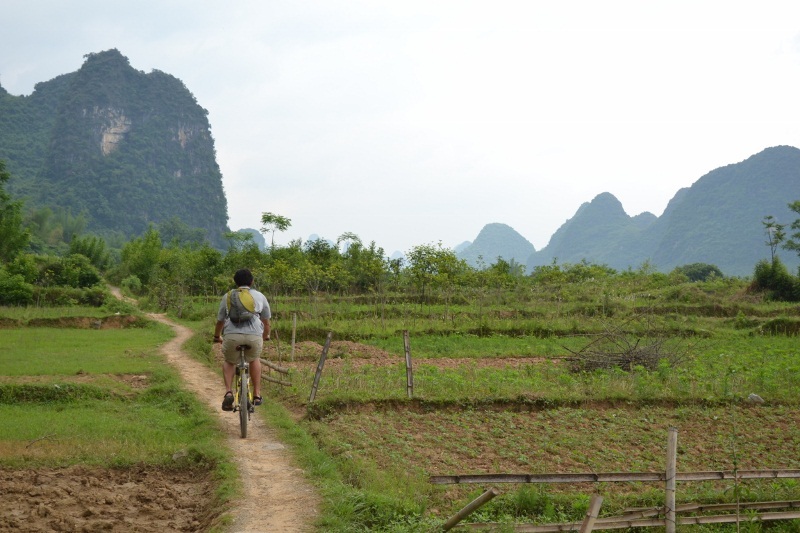 Mike cruising the trails alongside acres upon acres of farmland in the Yulong River Valley. We spent another one of our days in Yangshuo hiking toward the town of Fuli, but this time the heat was too much to handle. We only made it about 6km into the hike before opting for a more enjoyable plan: beers in the shade along the Li River. At our apartment in Denver, we frequently enjoyed sitting on our balcony and taking in the view with a beer or glass of wine, and we enjoy doing the same while traveling. View of the Li River from our secluded beer drinking spot in the shade. Throwing up the peace signs is a must when taking photos in China. 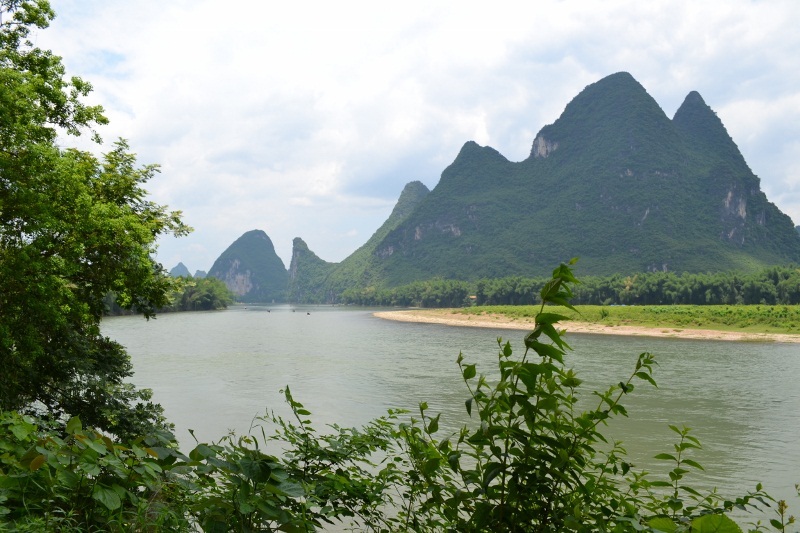 One of the many villages that sit along the Li River. Beautiful sky, but man was it hot! On our last day, we took a bus to the nearby town of Xingping. You can never really get tired of the amazing mountains in the area, but what we most enjoyed about Xingping was the town itself. 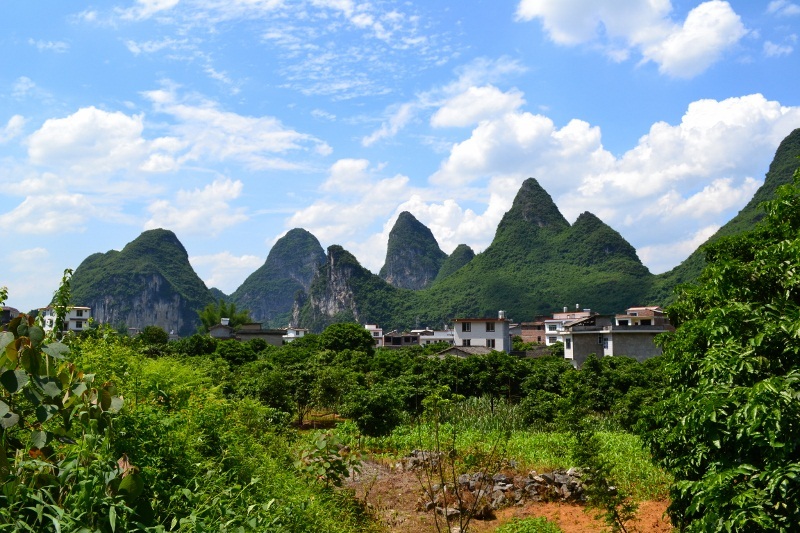 Its relaxed vibe stems from its small size, smiling locals and lesser influence of tourism than its neighboring cities of Yangshuo and Guilin. We considered changing our travel plans to relocate there for a few days, but the Longji Rice Terraces to the north were calling our name. The view of the Li River from the town of Xingping. 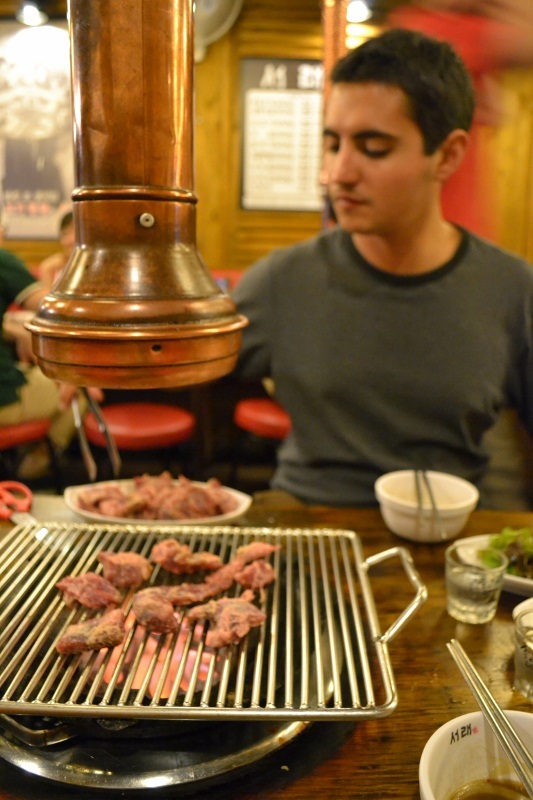 Back home, cooking and savoring fun and inventive meals is something we truly love, and it’s no different when we find ourselves in a foreign place. We were surprised by a cafe in Xingping where we enjoyed one of the best Chinese meals we have had so far. The pineapple duck and side of taro root with bok choy lingered deliciously in our mouths for the rest of the afternoon. 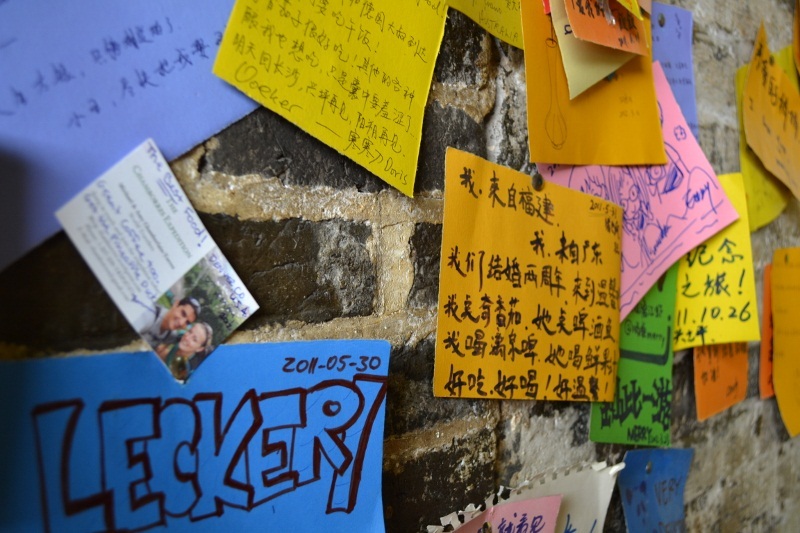 The walls of the cafe where we ate in Xingping were covered with notes of praise from customers from across the globe. 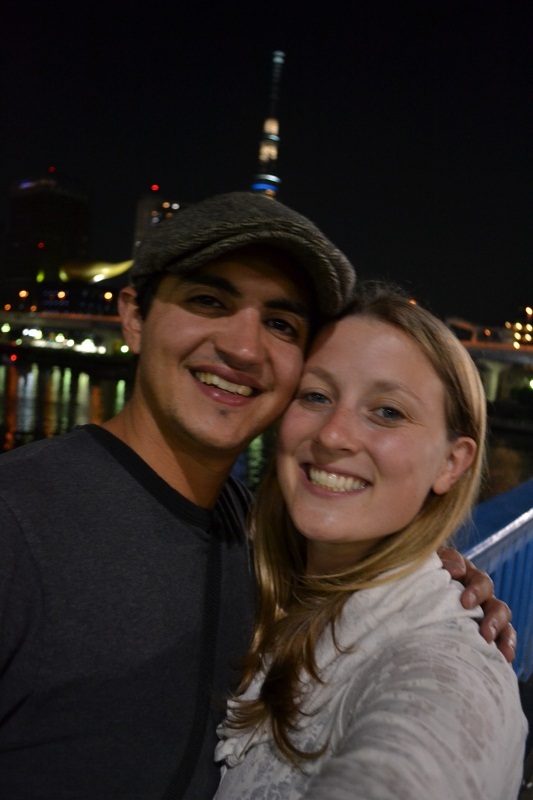 Abe – We miss you greatly, but your love for travel lives as we explore this amazing world. 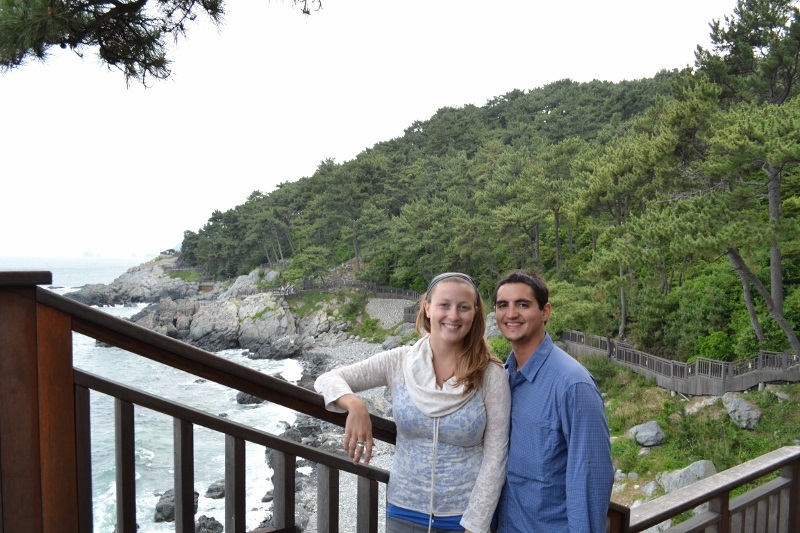 Max & Tamara – Another Siler, yes! We are so excited to meet Paul! Cindy & Marisol – Congratulations again on your engagement! We will 100% be there to celebrate with you on your wedding day! Alina & Mike – We welcome Sebastian into the world and our family! Liz & Alyssa – Sorry we couldn’t make the Portland Juice Press launch party. So proud of you and looking forward to our first taste of the juices upon our return! Nick – You the man! Congrats on your graduation and starting a new chapter in your life. We love you! Christina – You’re done with law school! Congratulations friend! We hope to celebrate with you down south after you take care of that pesky bar. And a big thanks to ALL of our readers! 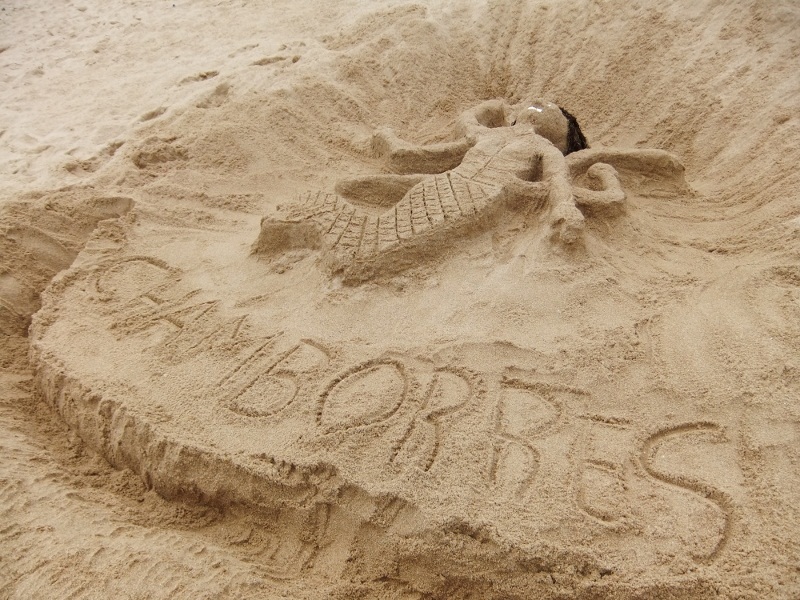 Sharing our experience via The Chamborres Expedition makes us feel a home wherever we may be.